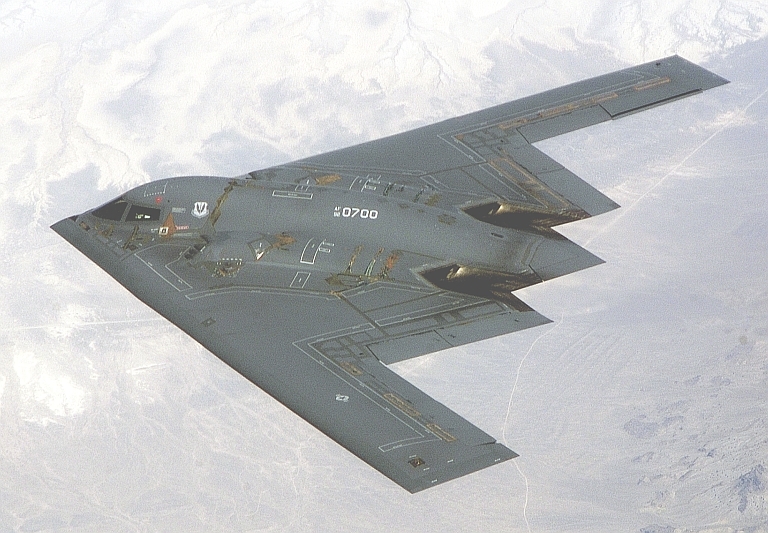 The Northrop-Grumman B-2A 'Batwing' is sufficiently large that its shaping remains effective against lower band radars. The same is not true for fighters with LO shaping (US DoD). 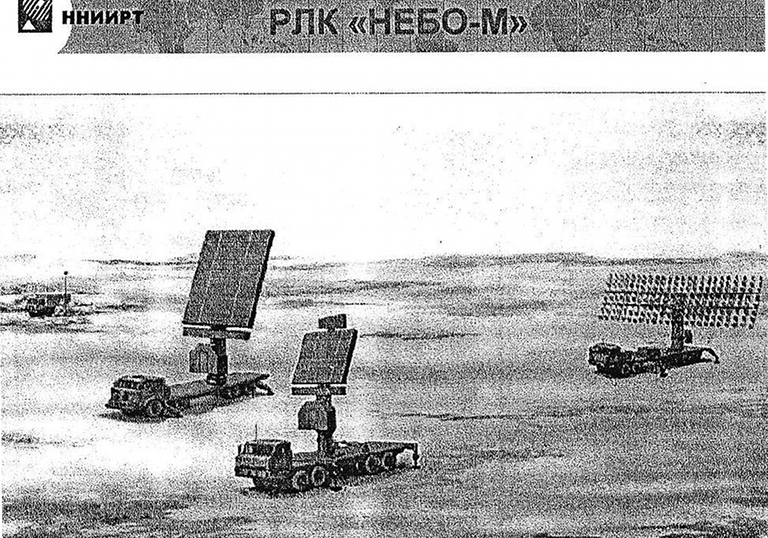 Prior to the rout of Saddam's extensive IADS in the 1991 Desert Storm campaign, the Soviets did not take US stealth technology seriously. Desert Storm changed that entirely, and the Soviets launched an effort to develop capabilities to detect VLO aircraft. 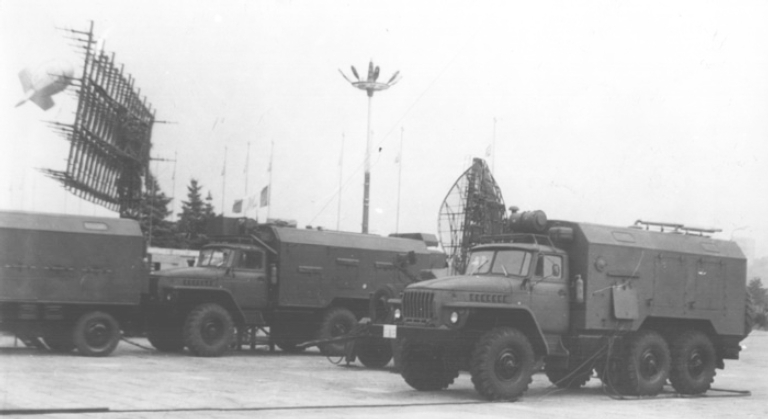 With the collapse of the USSR funding dried up, but Russian design bureaus including NNIIRT, well known for their line of P-18 Spoon Rest VHF band radars, continued developing new systems operating in the lower bands - from VHF through UHF to L-band. Most stealth design features are intended to scatter incoming illumination in a controlled fashion, evidenced by the use of edge alignment, faceting and other geometrical shaping features, supplemented by the use of absorbent materials. All of these techniques are intended to defeat radars operating in the geometrical optics and less frequently, resonance regimes of scattering. The precondition for this to work is that the wavelength be much shorter than the cardinal dimensions of the shaping feature of interest. An edge aligned engine inlet of typical dimensions will perform best in the centimetric Ku- and X-bands, and less so with increasing radar wavelength. The physics of radar scattering depend to a large extent on the size of the radar wavelength vs the physical size of the target. 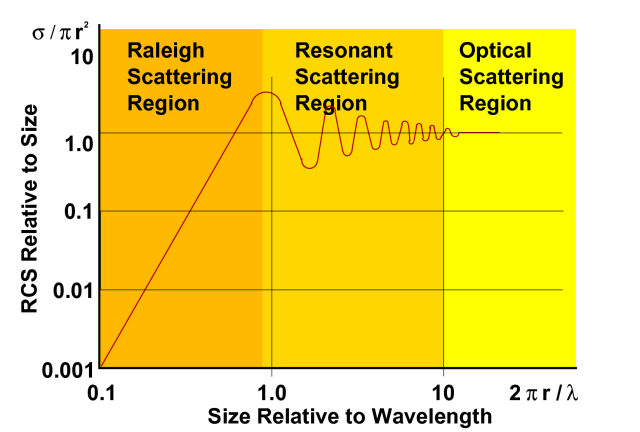 In the Raleigh scattering regime, the wavelength is similar or greater in magnitude to the physical size of the target, and the magnitude of the reflection is essentially proportional to the physical size of the target. As the wavelength is reduced, the resonant region is entered, where the wavelength is comparable in size to key shaping features on the target, and the magnitude of the reflection fluctuates strongly with wavelength and aspect. Finally, in the optical scattering regime, target shaping can be used to precisely control the magnitude and direction of reflections. The high effectiveness of stealth designs against decimetric and centimetric band radars reflects the reality that for most aircraft sizes, these wavelengths are a tenth to a hundredth of the size of key shaping features (Author). 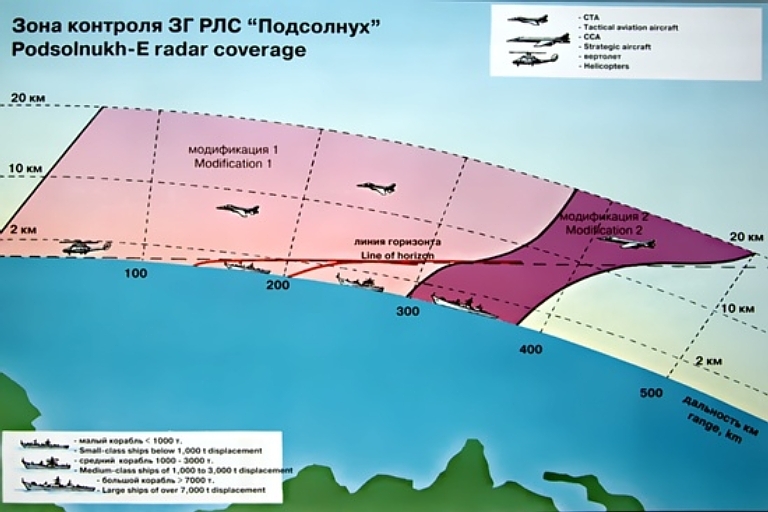 Where fighters with high power aperture X-band radars are available, such as Irbis-E or Zhuk ASE equipped Su-30/35 Flanker E/G/H variants, a low band radar can provide GCI vectors to position the fighter near enough for acquisition of the target, if need be with other sensors such as an IR Search and Track set. In practical terms one of the key advantages of VLO aircraft, surprise, is largely denied by the use of such systems. The VLO capability is still enormously valuable in terms of degrading or defeating most engagement radars and missile seekers, but the defender regains access to the early phases of the engagement cycle otherwise also defeated by VLO capability. The US Air Force is expected to use the F-22A Raptor armed with the glide wing equipped GBU-39/B SDB to destroy a defender's low band systems in the opening minutes of an engagement, relying on the standoff range of the weapon and speed/altitude of the fighter to deny engagement opportunities by defending IADS elements being cued by the low band radars. Other fighters do not have these capabilities and become exposed to defending IADS elements. 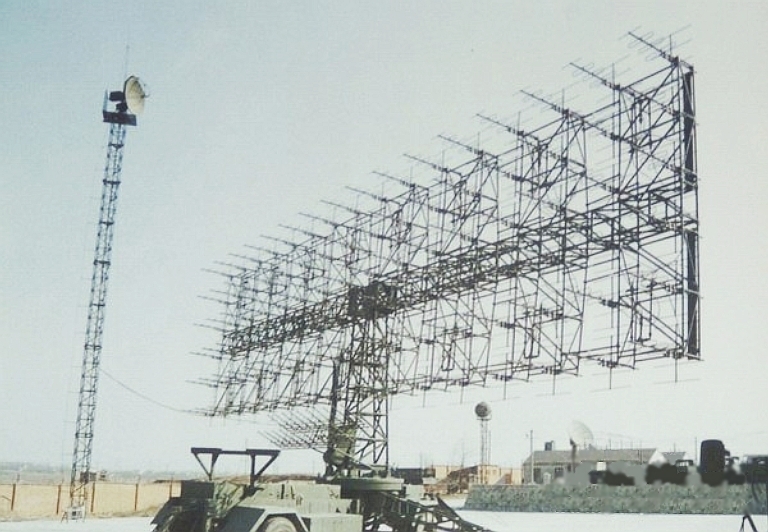 The notion that Russian low band radars are artifacts of the Cold War with little combat value is foolish, as current production models are typically 'digitised' through most of the signal and data processing, and display components, and many now use solid state transmitters. At least two designs are AESAs (active phased array). Russian manufacturers have thus followed much the same trend as Western manufacturers, enhancing Cold War era systems designs with digital processing. More than often modern Digital Moving Target Indicator (DMTI) or digital pulse Doppler techniques are employed, some types also using Space Time Adaptive Processing (STAP), exploiting the high performance of COTS computing technology, readily available in the open market and easy to ruggedise for a semi-mobile application of this kind. 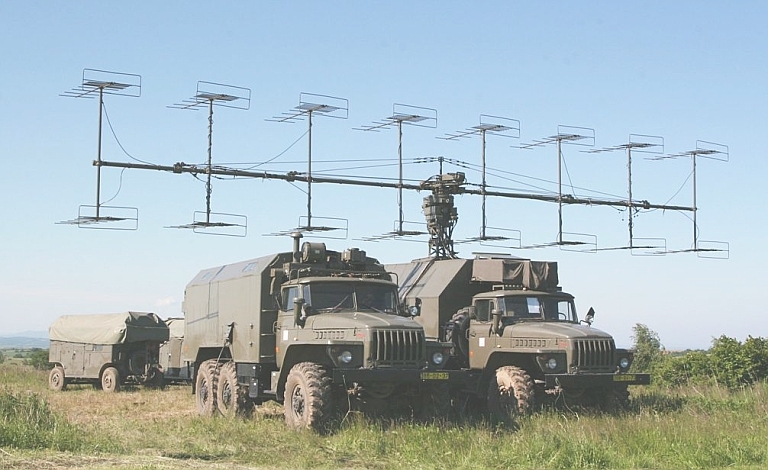 Russian industry is very actively marketing digital upgrades to the P-18 Spoon Rest, and new production digital 55Zh6 Nebo UE / Tall Rack and Nebo SVU VHF radars, specifically as a "Counter-Stealth" capability. 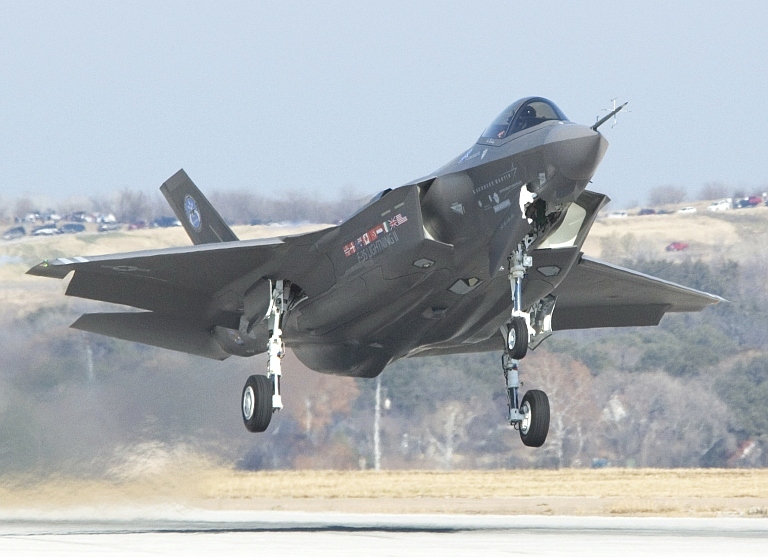 While the JSF is frequently criticised for the limitations of its stealth capability in the mid and upper microwave bands, the compact size of this aircraft makes it highly susceptible to detection by low band radars, unlike larger aircraft such as the B-2A Spirit (US Air Force). 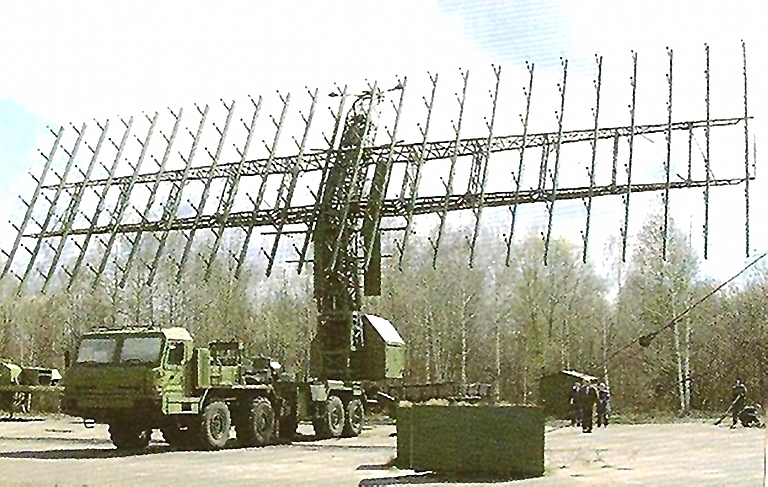 Marketed by Rosoboronexport as a "Stealth Air Target Early Warning Radar" the Rezonans N and NE are large long range VHF band semi-mobile radars. 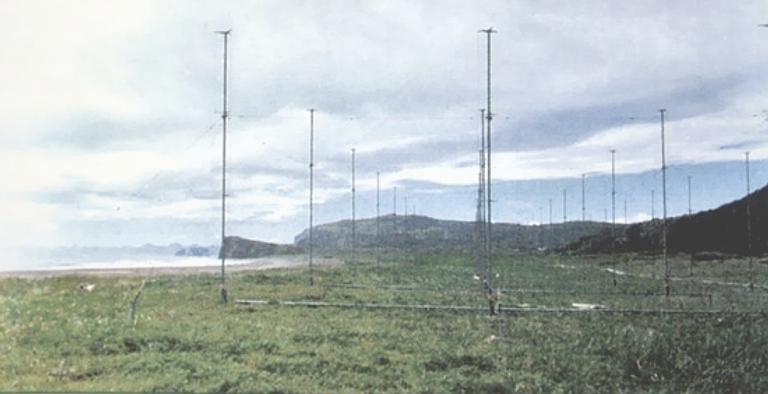 Little has been disclosed on this design and only one image has been officially released to date, depicting an antenna array and separate antenna installation. 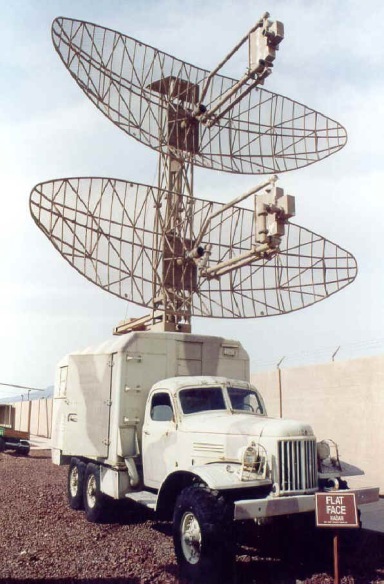 "The Rezonans-N radar is a mobile highly automated coherent all-round surveillance phased-array radar employing the resonance wave reflection effect in the metric wavelength band. It is designed to monitor airspace, to acquire, identify and measure with high accuracy co-ordinates and flight characteristics of a wide range of existing and prospective air targets at long ranges and high altitudes, including low-observable cruise and ballistic missiles and hypersonic aircraft, as well as stealthy ones, in severe jamming and clutter environment, as well as to be used within automated/non-automated command and control systems, non-strategic missile defence systems, rapid deployment assets, and in various military/civil-purpose applications." 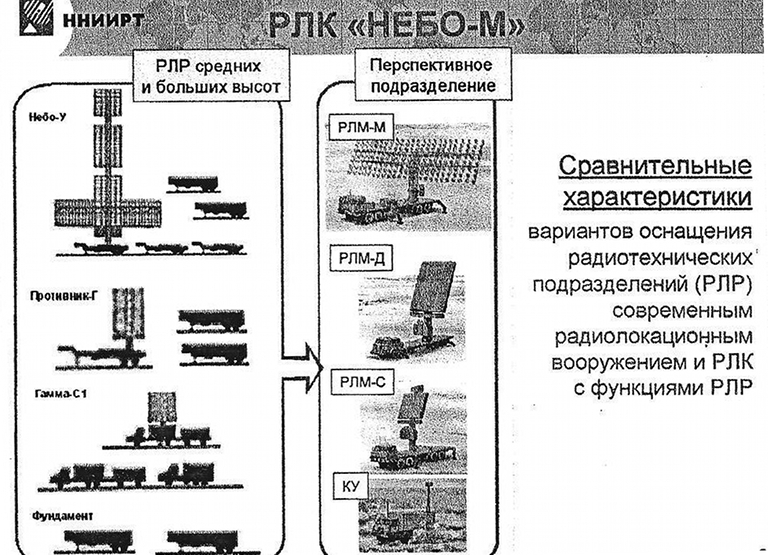 Other Russian sources claim the radar is deployed on six trailers or semitrailers, requiring 24 hr to set up or stow for movement. Cited power consumption is 100 kiloWatts which suggests robust peak power ratings at low duty cycles. 1L13 Nebo SV / Box Spring. NB vertical polarisation of Yagi elements. The new Nebo SVU AESA is an improved new technology derivative of the baseline 1L13 Nebo SV / Box Spring series of VHF radars. 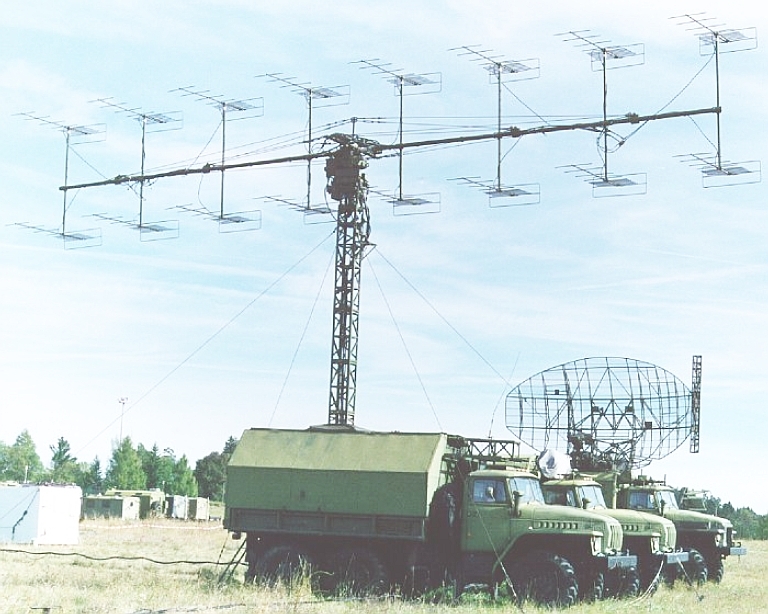 It has an array of 84 (14 x 6) vertically polarised VHF Yagis, unlike the 72 elements in the 1L13, each with a 3/8 folded dipole and director element. Unlike the 1L13 carried by a Ural 4320 6x6 truck, the larger Nebo SV is a semi-trailer arrangement towed by a Ural 4320 tractor. Active phased array antenna (AESA) design with a Transmit Receive Modules integrated with each of the antenna elements, analogue-to-digital conversion of each channel, with the option of digital beamforming in the vertical plane for ABM operating modes. Adaptive automatic operation to handle countermeasures and antenna element failures. Digital processing designed to handle adverse weather and intensive chaff bombing. 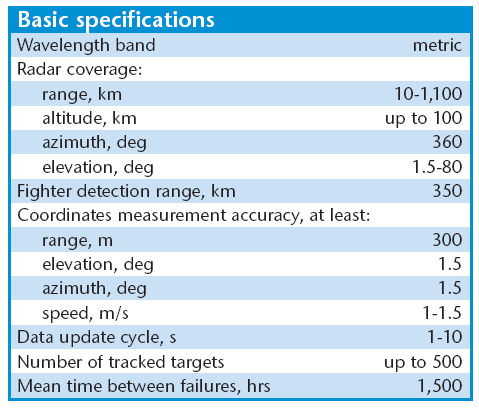 Very high 500 hour MTBF compared to legacy VHF radars, as a result of the AESA technology used. A key consideration when assessing the Nebo SVU is its greater mobility compared to other VHF radars. 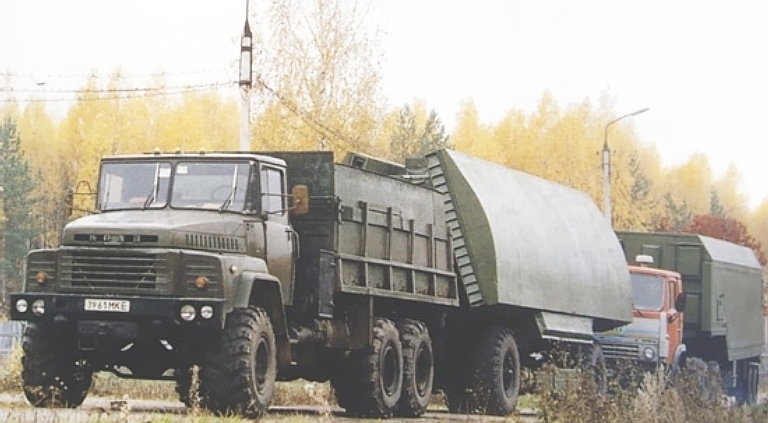 The Ural 4320 towed trailer arrangement has similar cross country and road mobility to the KrAZ-260 towed variants of the S-300PMU/S-400 TEL. More importantly, the ~20 minute deployment and stow times are much improved over earlier VHF radars in this class, more than twofold compared to the P-18 Spoon Rest or Nebo SV, and threefold over the legacy S-300PMU acquisition radar, the 36D6 Tin Shield. 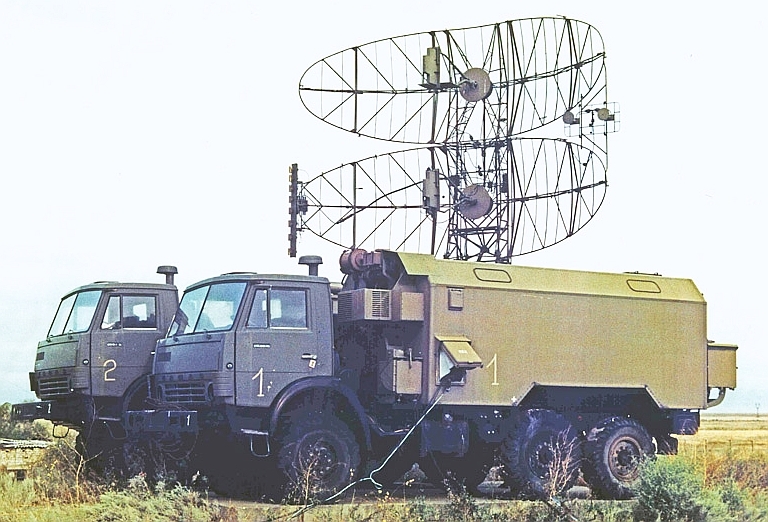 Currently the most mobile Russian acquisition radar is the 64N6E/91N6E series ESA, towed by a MAZ-543 derived tractor, and capable of "shoot and scoot" operations with times of minutes. 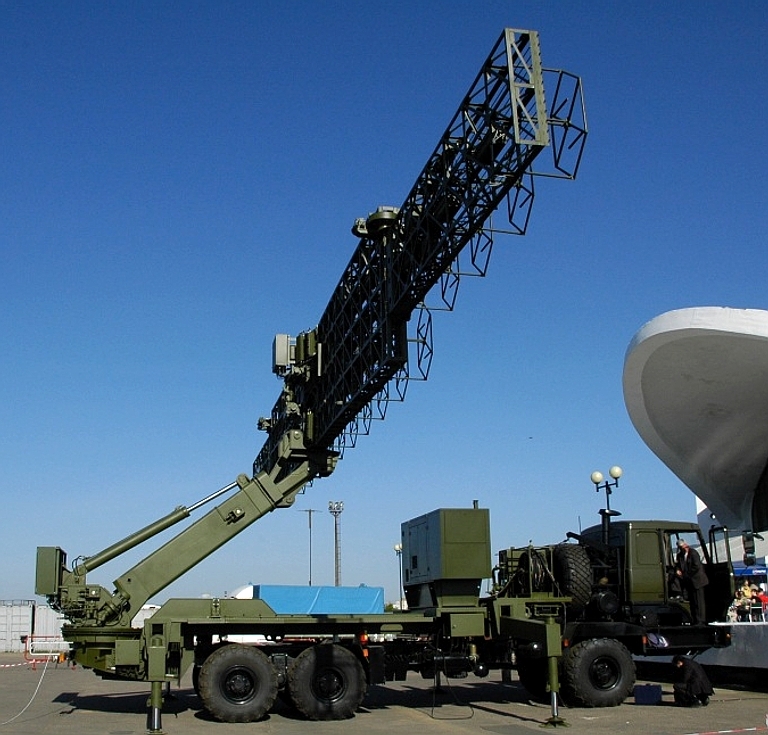 A self propelled variant of the Nebo SVU has been developed as part of the new NNIIRT Nebo M Mobile Multiband Radar System, it is claimed to be equipped with a more advanced hydraulic stow/deploy mechanism to emulate the "shoot and scoot" capabilities of the 64N6E/91N6E series. What has not been disclosed about the Nebo SVU is the specific mechanism used for high precision angle tracking, it is likely that high speed electronic sequential lobing is employed to emulate amplitude monopulse techniques. Details of the active sidelobe cancellation and jammer nulling mechanisms have also not been disclosed. 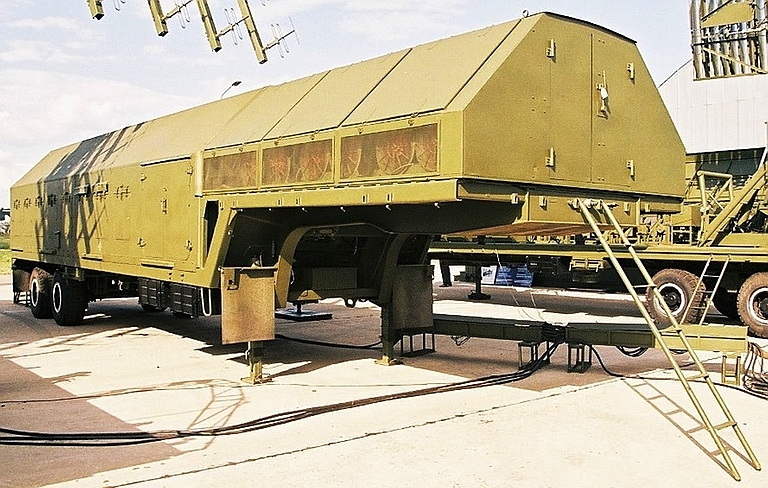 While reports have emerged of the integration of the 55Zh6 Nebo UE with the S-400 C3 system, none have been seen as yet on the integration of the Nebo SVU. 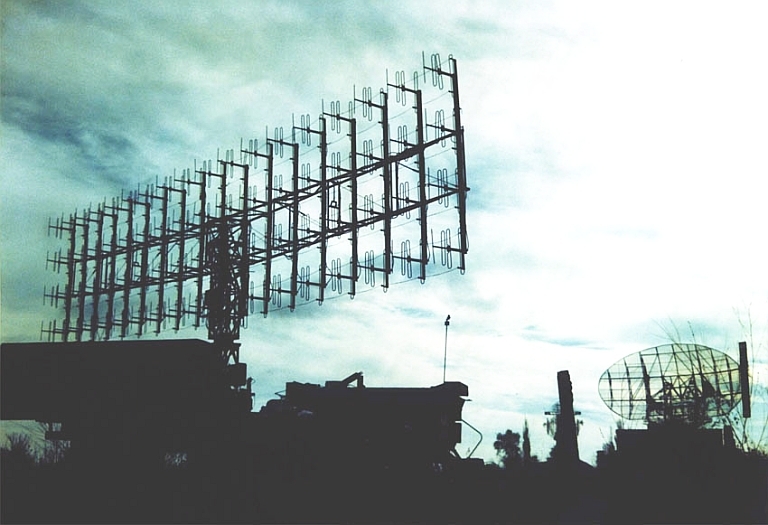 The radar is claimed to provide pseudorandom frequency hopping, and ECCM capabilities. The absence of elevation error specs suggests the radar lacks a height finding capability. All images to date show a towed installation. The very sparse brochure claims the radar is 'fully solid state' but no further details have been disclosed. The CETC YLC-8 and YLC-8A are clearly derivatives of the P-12/P-18 Spoon Rest family of radars, widely exported as part of S-75 Dvina / SA-2 Surface to Air Missile Batteries. 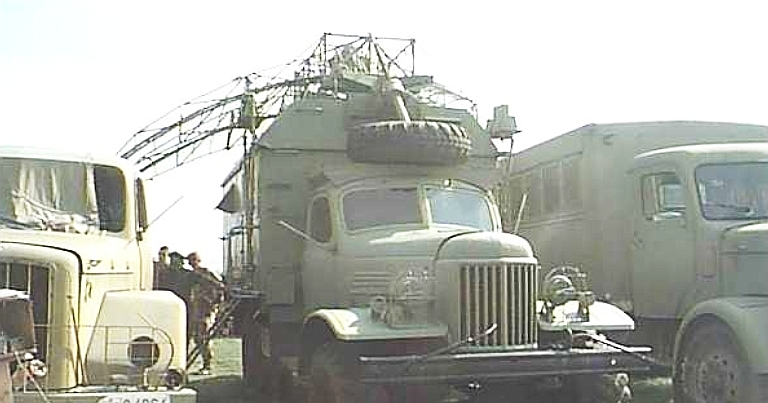 Unlike the self propelled Soviet original, the YLC-8 is carried on a semi-trailer. Like the Spoon Rets, this design uses a horizontal boom to deploy sixteen Yagis, each with a reflector, dual folded dipole and five director elements. 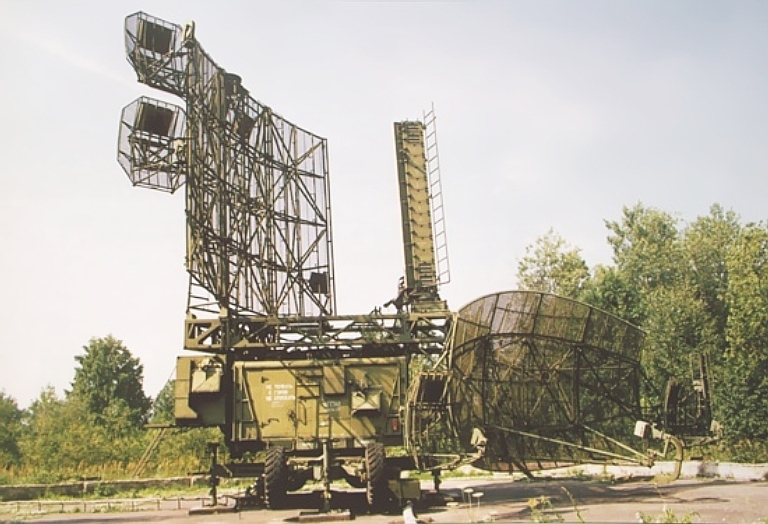 The KB Radar (Agat) Vostok D/E is an entirely new 2D VHF radar design, using a unique wideband "Kharchenko" square ring radiating element design, in a diamond lattice pattern (all images KB Radar). Developed recently by Agat/KB Radar in Byelorussia, the Vostok is an intended replacement for the P-18 Spoon Rest series. It is a digital solid state design, operating in the VHF band. While detailed specifications have been disclosed, design details have not, especially in relation to the internal architecture of the design. The manufacturer claims a detection range of ~40 nautical miles against the F-117A Nighthawk, or other types with similar VHF band RCS, in a jammed environment, and 190 nautical miles in an unjammed environment, with an overall 30 to 40% improvement in range performance against the Spoon Rest D/E. Two demonstrators were built and displayed at the Milex 2007 industry expo in Minsk. 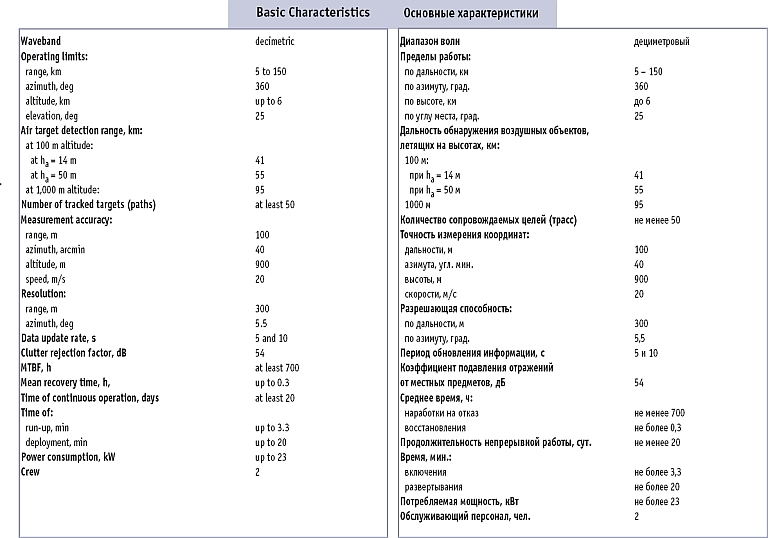 A technical white paper and concurrent discussion paper reveal some interesting details, although not as much as has been disclosed on competing Russian designs like the Nebo SVU. 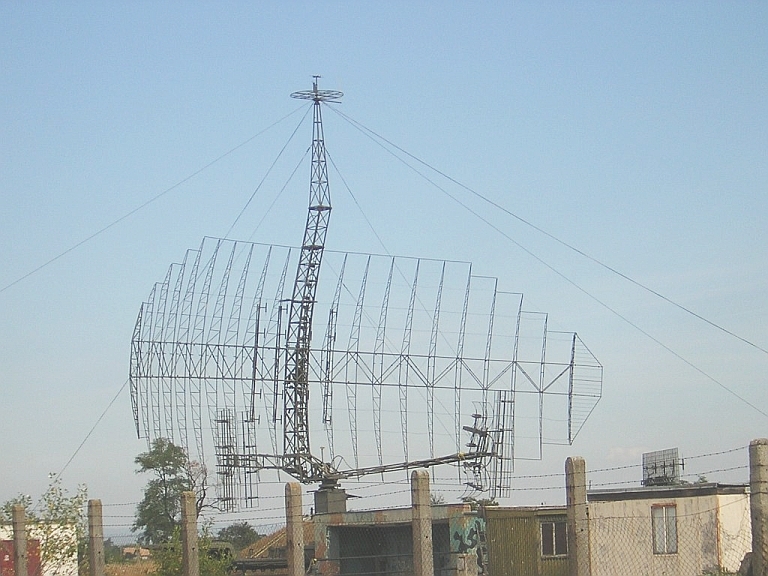 The design uses a unique wideband "Kharchenko" square ring element radiator, arranged in a diamond lattice pattern, intended to improve frequency agility against earlier VHF designs. The boxes distributed through the framework of the active array antenna are transmit-receive modules for the radiating elements. 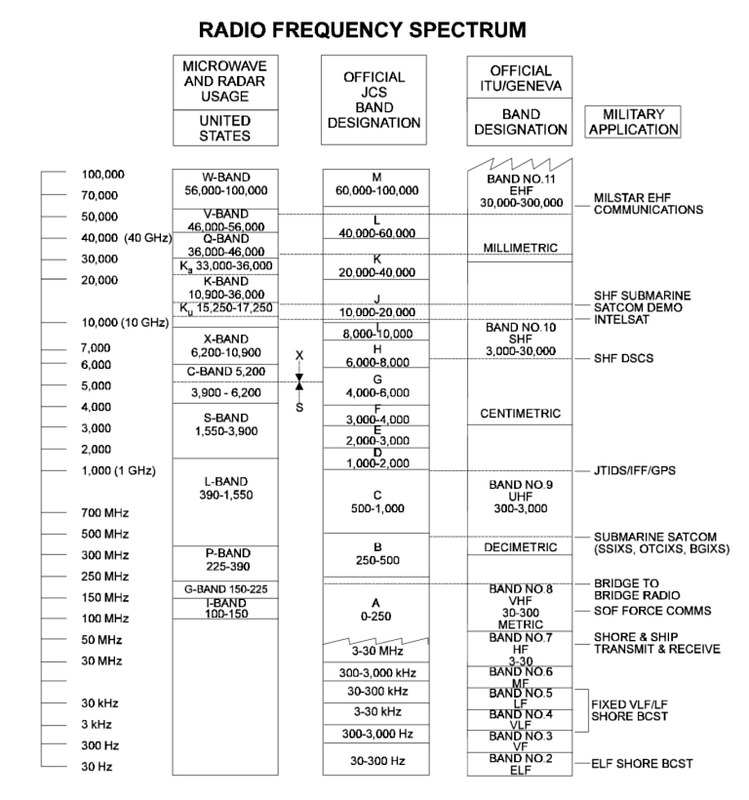 The cited system MTBF is 1200 hours, exceptional for this class of radar. The hydraulically folded and elevated antenna is mechanically rated for 65 knot wind gusts, and both levelling of the platform and antenna deploy/stow operations are fully automated. 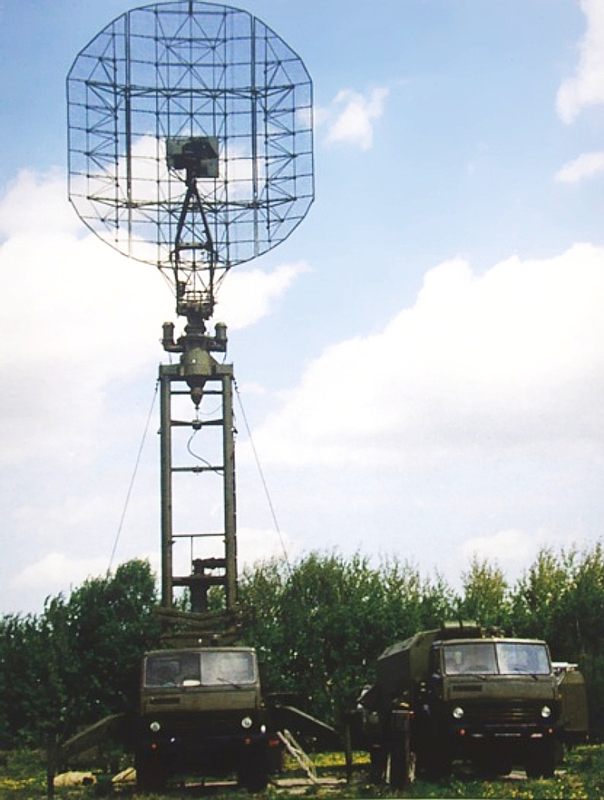 Specific design aims in the Vostok E included overcoming common limitations in legacy VHF radars, in particular the poor sensitivity and clutter rejection performance, the high peak power which exposes the radar to ESM equipment, the long time to deploy and stow the antenna, and the poor fractional bandwidth which limited frequency agility. 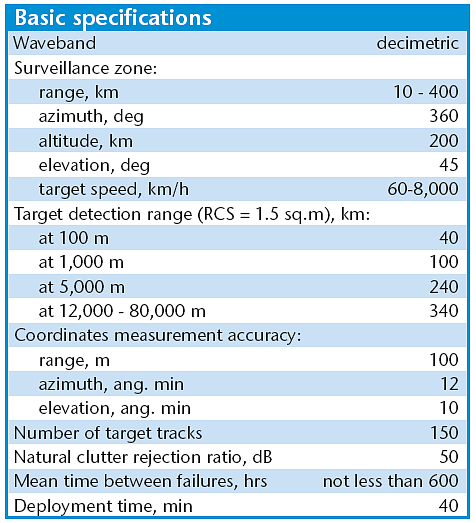 The radar has a centre frequency of 175 MHz, and is frequency agile across fifty discrete frequency channels in the radar passband, using either random frequency hopping, or an adaptive control law which avoids frequency channels occupied by jammers. Three channels are used for adaptive suppression of jammer signals. Low peak power is used to minimise detection range against hostile ESM. Coherent integration techniques are used, and all signal processing is digital. An adaptive processing technique is used for clutter rejection (whether this qualifies as STAP will depend on future disclosures). The Digital MTI processing is claimed to provide a dynamic range of 50 to 60 dB. The cited RMS ranging error is 25 metres, angle error 1.1°, and velocity error 1.8 m/s, bearing to a jammer can be measured with an error of ±1°. This performance is not as good as the AESA design in the Nebo SVU, and the Vostok E lacks a heightfinding capability. The fully automated digital data processing subsystem provides a range of automatic tracking modes, and is designed to interface to cable or RF datalink channels to other IADS elements. No less than 120 aerial targets can be tracked. A satellite navigation terminal is integrated to facilitate rapid operation starts, in a "shoot and scoot" environment. 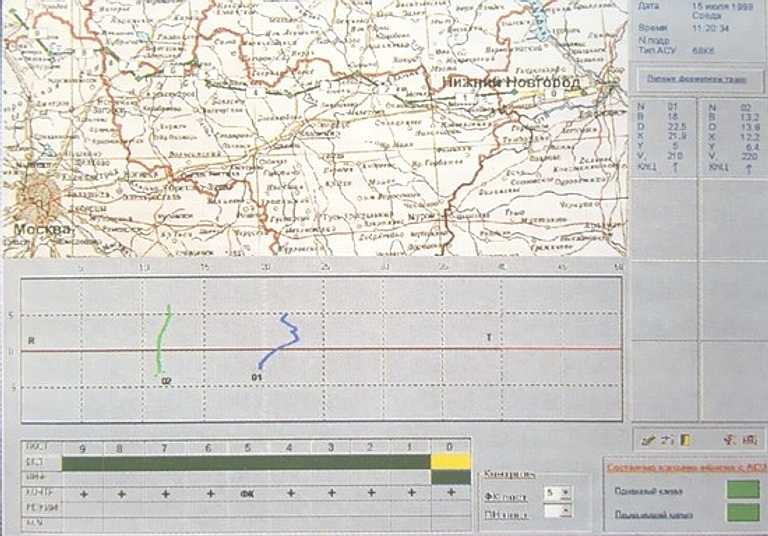 A digital map system is provided to facilitate operations, the design can display target parameters, and programmable engagement zones or other airspace boundaries. 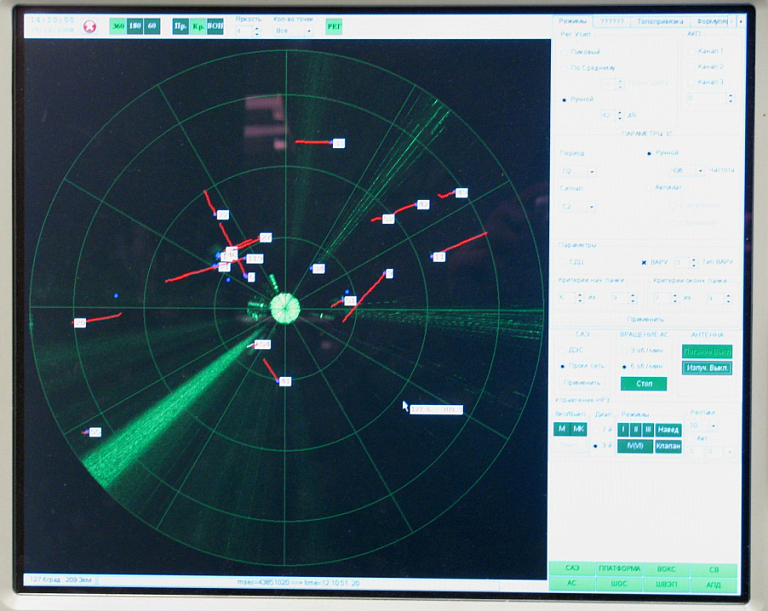 The radar is also equipped with a signal emulator which generates synthetic target tracks, and possibly jamming waveforms. Signal and data processing is performed in the radar van equipment. The time to deploy or stow the antenna is cited at less than 6 minutes, making this a genuine "shoot and scoot" design. The operator van is based on the same arrangement as the van for the truck mounted Ranzhir E variant or Polyana command posts, carried on a 6 x 6 MZKT 65273-020 series chassis. 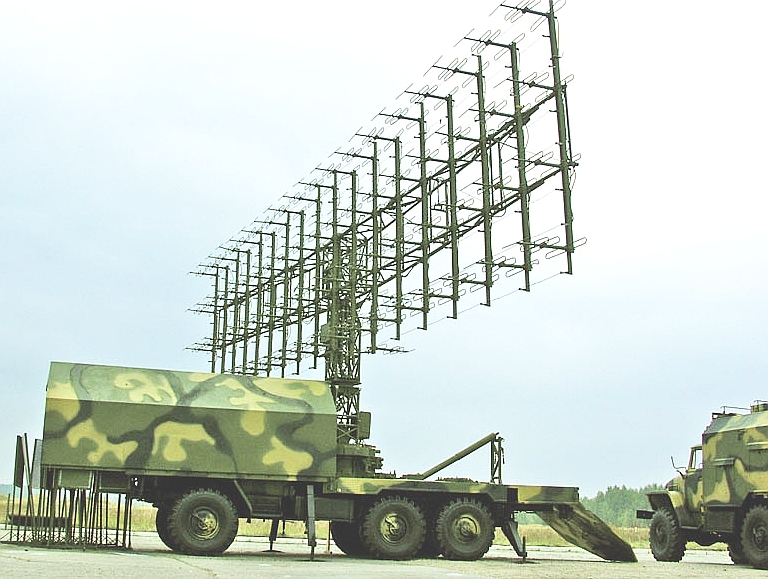 A production Vostok E will be a formidable 2D acquisition radar, by virtue of its modern RF design and high mobility. As a replacement for the legacy Spoon Rest, the Vostok is much more capable and mobile than the 1L13 Nebo SV / Box Spring used by Russian forces. We should not be surprised if a future Vostok AESA derivative emerges, as a competitor to the larger Nebo SVU. KBR reported the first export sale, to an undisclosed customer, early in 2009. A Vostok E demonstrator deployed. The van houses the three operator stations and electronic hardware. Operational deployment of a Vostok E at a prepared site. Vostok E antenna system stowed (above), and unfolding for operation (below). П-18 / P-18 «Восток» / "Vostok"
NITEL modernised P-18 Spoon Rest (NITEL). Slovakian Army P-18 (Images © Miroslav Gyűrösi). Stowed Configuration Image (1) Here. 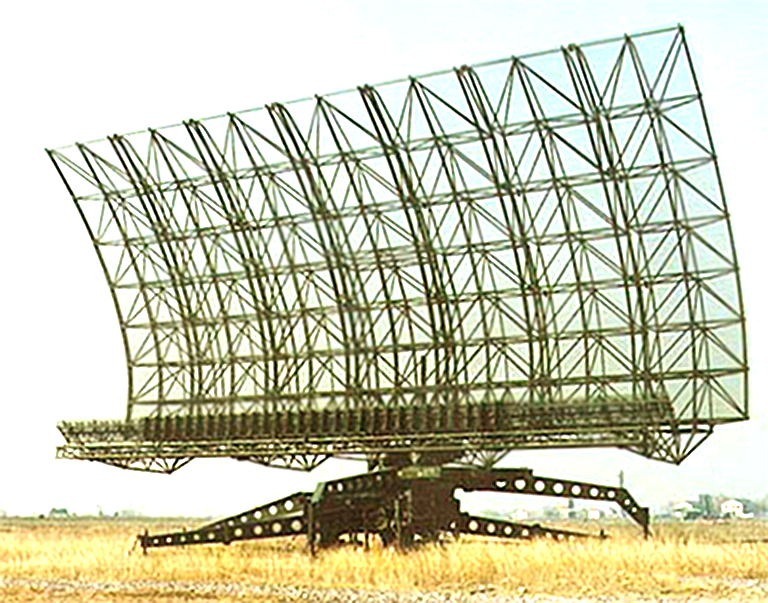 Kasta 2E1 Flat Face E UHF Band Acquisition Radar. The Kasta 2E1 and 2E2 are the latest incarnations of the well established Flat Face and Squat Eye family of semimobile UHF band tactical acquisition radars. 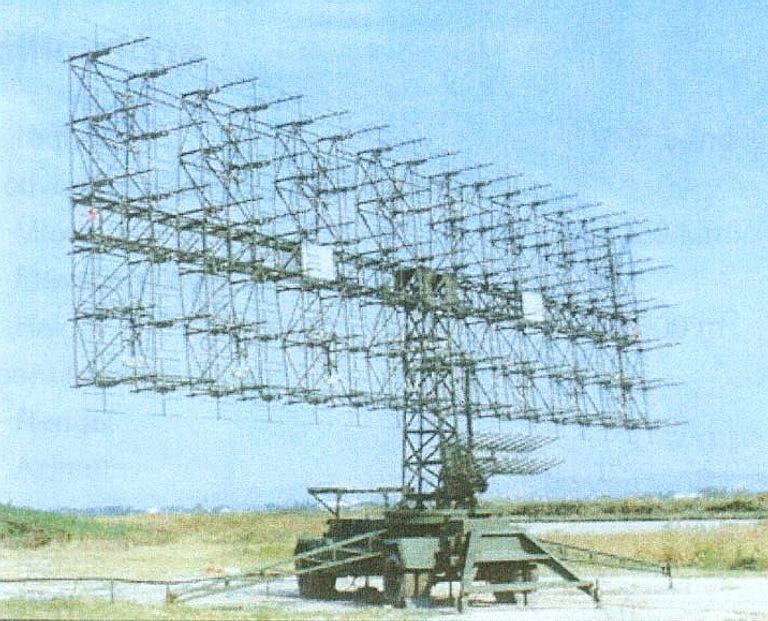 The initial P-15 Flat Face A introduced the now characteristic double stacked array of elliptical paraboloid section antennas. 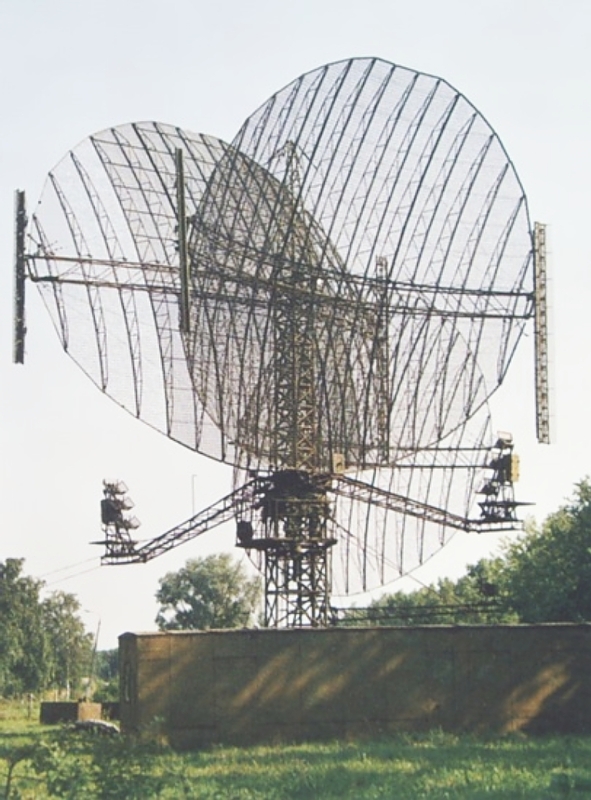 This radar was widely exported by the Soviets to Warsaw Pact nations and Soviet Third World allies and clients. 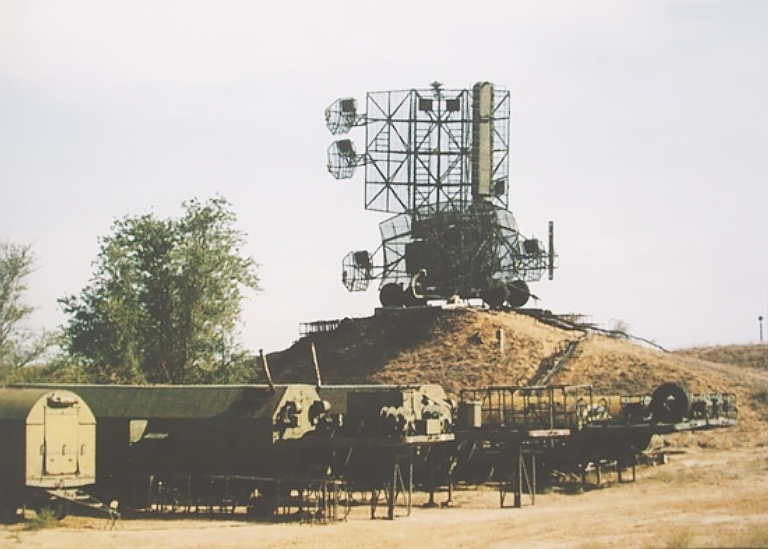 The radar has been used to support interceptors, as well as SA-3, SA-4, SA-6 and SA-8 missile batteries as an acquisition radar. The P-15M Squat Eye is a derivative of the baseline design with a single antenna on a tethered latticework mast. It was employed to improve low altitude coverage, but also to permit use of the radar in heavily forested terrain where the height of the foliage canopy exceeded the height of the antenna phase centre in the P-15. The P-19 Flat Face B is the improved follow-on to the P-15 with a range of improvements. Since the 1990s a number of manufacturers are now offering comprehensive digital upgrades for the P-15 and P-19 inventory. 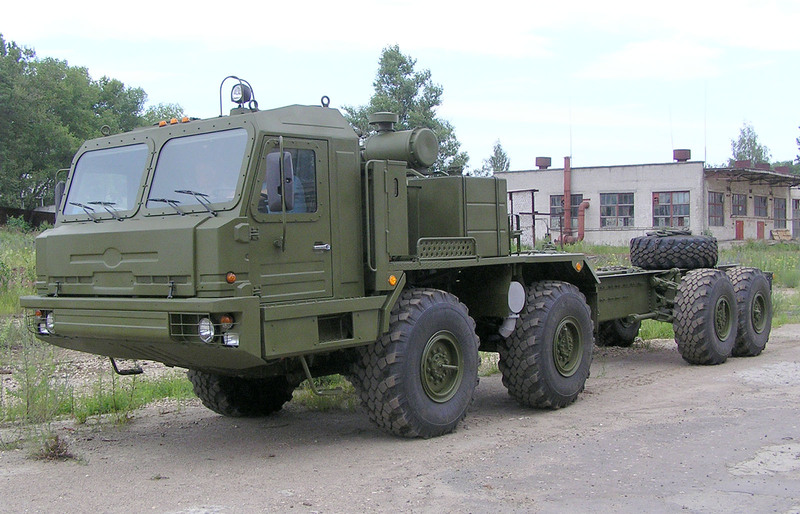 Kasta 2E1 and 2E2 are heavily redesigned derivatives using a new KAMAZ 6 x 6 chassis and mostly digital hardware. The redesign of the Squat Eye antenna is the most visually prominent change with the increased aperture improving range performance. Due to their low power-aperture ratings this family of radars is generally not regarded to be particularly effective against LO and VLO aircraft. Stowed Configuration Images (1) and (2) Here. The VNIIRT Desna M series of surveillance radars are intended to be kept in use until 2025 with upgrades. The design is semi-mobile with a similar configuration to the Bar Lock series. There are no reports of significant exports of this radar. Accuracy of target tracking at 10,000 m Alt. The 29N6 Delta was designed for fixed operation in remote locations and is commonly deployed on a latticework mast with tethers.The antenna arrangements available include single reflectors or Janus-faced paired reflectors. A IFF arrays are often attached to the side of the primary aperture. The design uses three stacked beams. 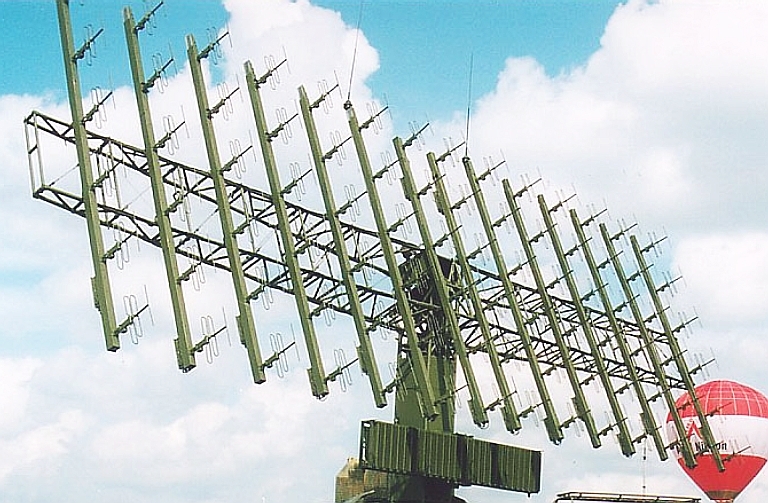 There are no reports of significant exports of this radar. Обслуживающий персонал в одну смену, чел. VNIIRT Gamma DE AESA deployed configuration (above) and stowed configuration (below). Three subtypes exist, the D1/D1E, D2/D2E, and D3/D3E with differing module power ratings and range performance. Depicted is the towed configuration with a 20 minute deploy/stow time. 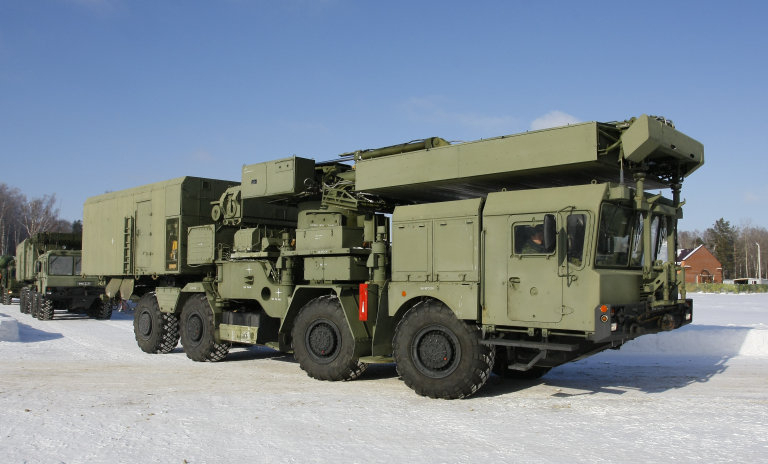 VNIIRT disclosed in 2007 that a self-propelled variant was available, with a 5 minute deploy/stow time compatible with the S-300PMU2 and S-400 SAM systems. To date no imagery of the self-propelled variant has been disclosed. 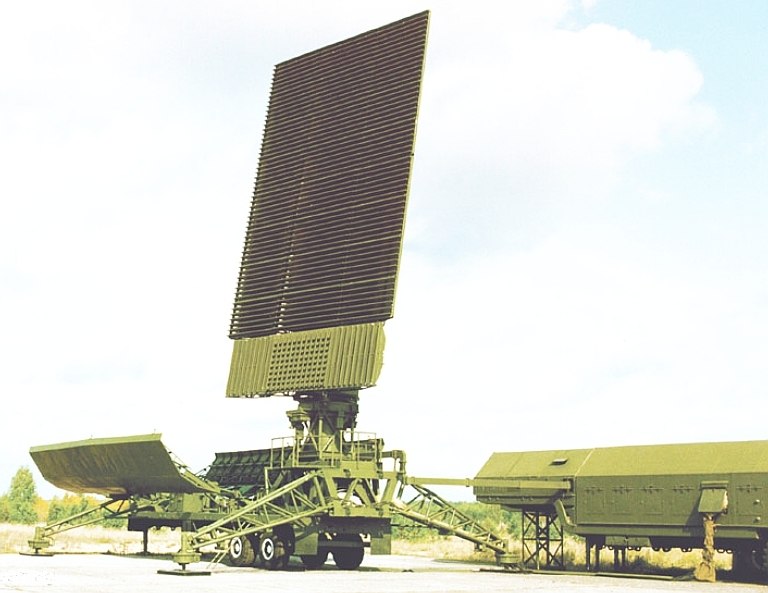 The VNIIRT Gamma DE is a solid state long range L-Band 3D Active Electronically Steered Array (AESA) search and acquisition radar intended to support interceptors and Integrated Air Defence Systems. 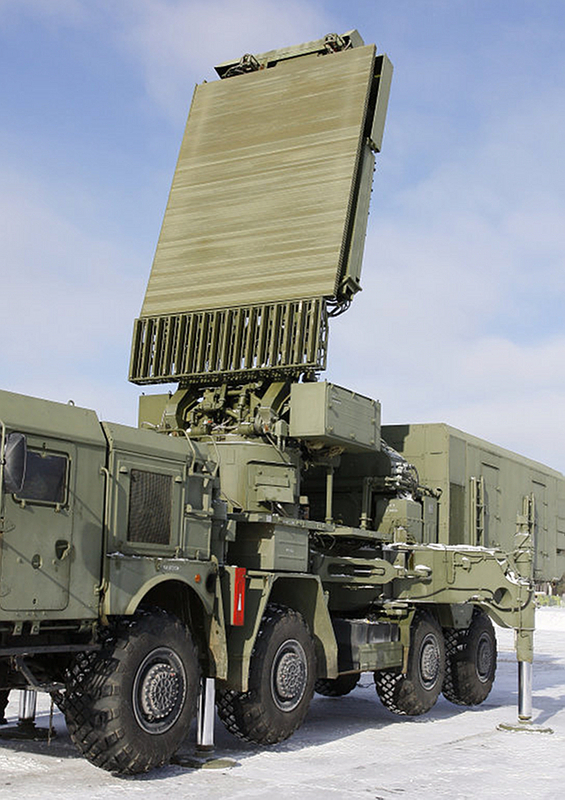 It is intended to detect and track aircraft, cruise missiles, precision guided munitions and tactical ballistic missiles at medium and high altitudes. 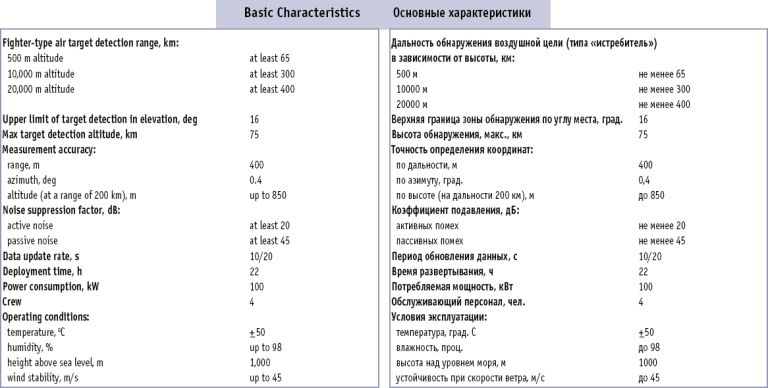 The manufacturer cites two basic operating modes "iso-range" and "iso-altitude". Gamma DE installations can be supplied with three different AESA module power ratings, yielding the D1/D1E, D2/D2E and D3/D3E variants. Cited MTBF in recent literature is ~1,000 hrs which is consistent with mature AESA technology. The ability to concentrate emitted power into search sectors which are being subjected to jamming, to decrease the J/S ratio. Wideband pulse-to-pulse automatic frequency hopping with automated avoidance of jammed frequencies (i.e pre-transmit sniffing), employing a spectrum analyser. Signal processing functions to reject incoherent signals received in the mainlobe, such as jammers or other interfering in-band emitters. Multichannel rejection of jamming. This is likely to have been implemented by forming nulls in the mainlobe. Jammer rejection by sidelobe blanking. Adaptive multichannel pulse Doppler filtering for clutter rejection. While VNIIRT literature describes this as DMTI, it is not clear whether the technique used is conventional DMTI or pulse Doppler. Rejection of jammers and signals with low radial Doppler shifts relative to the radar. Another very modern feature in this design is the use of Non-Cooperative Target Recognition (NCTR). 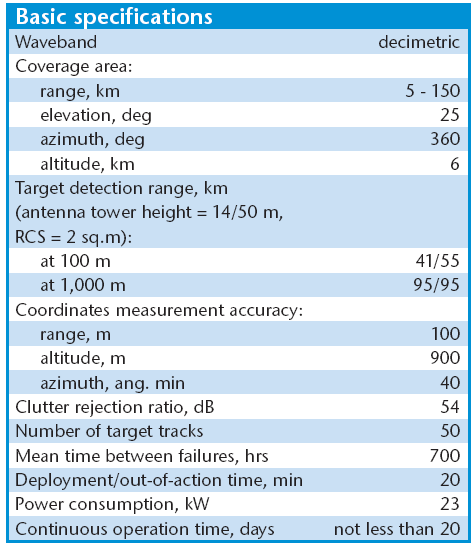 This is claimed to be performed by the analysis of backscatter power levels, correlation against known signatures, and the flight trajectory characteristics of the track. Helicopters are recognised by analysing the advancing and receding rotor blade Doppler shifts. 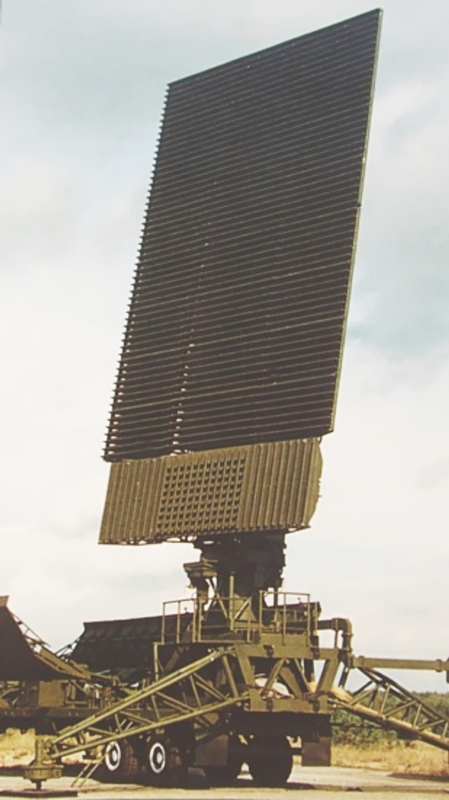 To defeat anti-radiation missiles and Emitter Locating Systems, the Gamma DE employs short burst transmissions, with radar emission timing slaved to the Gazetchik E emitting anti-radiation missile decoy system. In addition chaff, smoke generators and infrared decoys are employed to seduce missiles with active radar, electro-optical or imaging infared seekers. 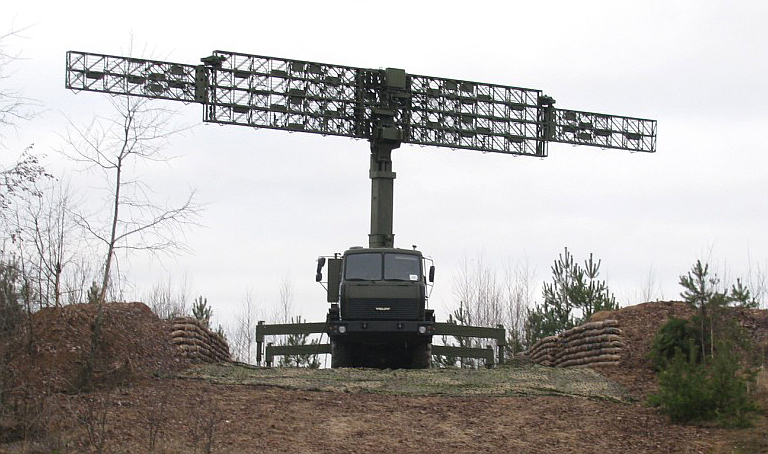 The Gazetchik E is claimed to achieve a 0.85-0.95 Pk against anti-radiation missiles. It is worth noting than many such missiles do not have the band coverage to home in on an L-band emitter such as the Gamma DE. 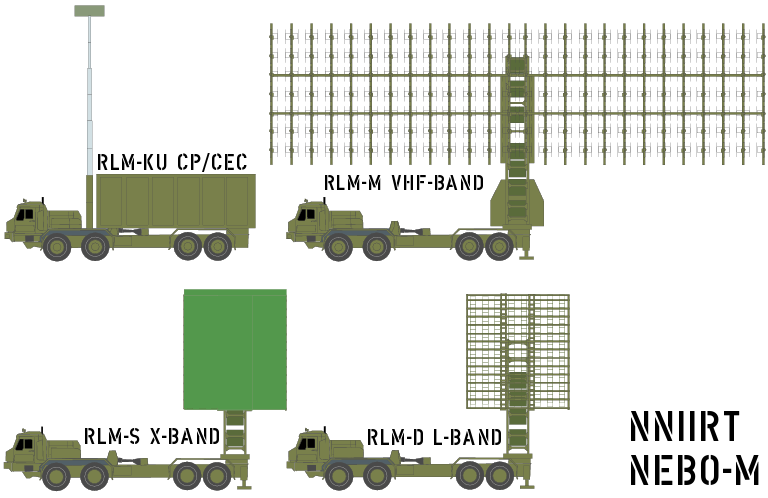 Like many Western L-band radars, such as the MESA, the Gamma-DE has an integrated IFF function in the primary array, supporting Mark XA and XII modes. This is performed using the VNIIRT developed Voprosnik-E secondary radar, embedded in the Gamma-DE antenna system. The AESA design provides cited mainlobe steering angles of up to ±60° in azimuth and elevation. VNIIRT claim a robust detection range of up to 600 nautical miles against high elevation angle ballistic missile targets. 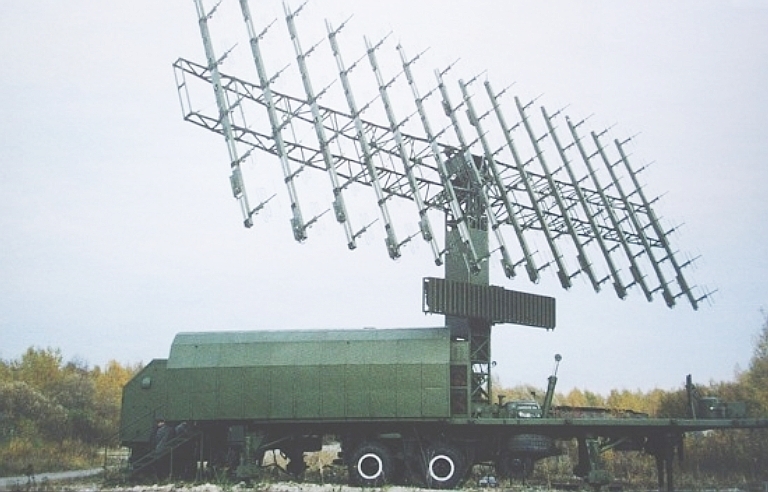 Like Western phased array radars the Gamma DE is capable of adaptively interleaving search and track beams, and nulling particular angular sectors which are subject to jamming. Modes include high update rate search waveforms in narrow solid angles, providing for high quality tracking of high speed closing targets. A single Gamma DE system comprises a towed antenna head trailer with the 1280 element 8 x 5.2 metre AESA on a turntable, a semi-trailer radar cabin with electronics and operator stations, and a dual redundant 16 kiloWatt diesel generator. 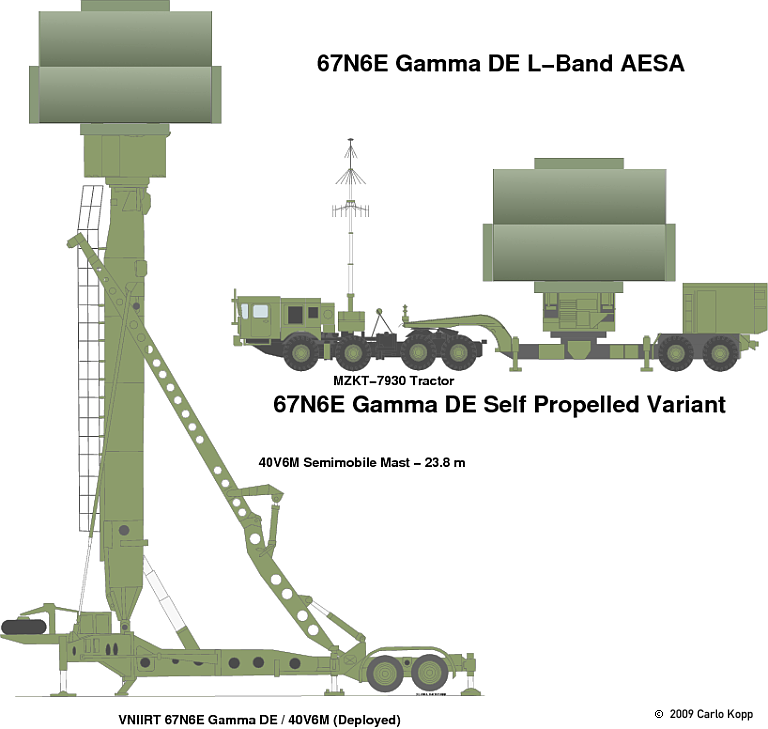 An option cited for the Gamma DE is deployment of the radar head on the 24 metre 40V6M or 40 metre 40V6MD semi-mobile mast systems. The latter are carried by semi-trailer and typically towed by a MAZ-537 or other tractor. Cited time to deploy the basic demonstrator configuration is 1.5 hrs. 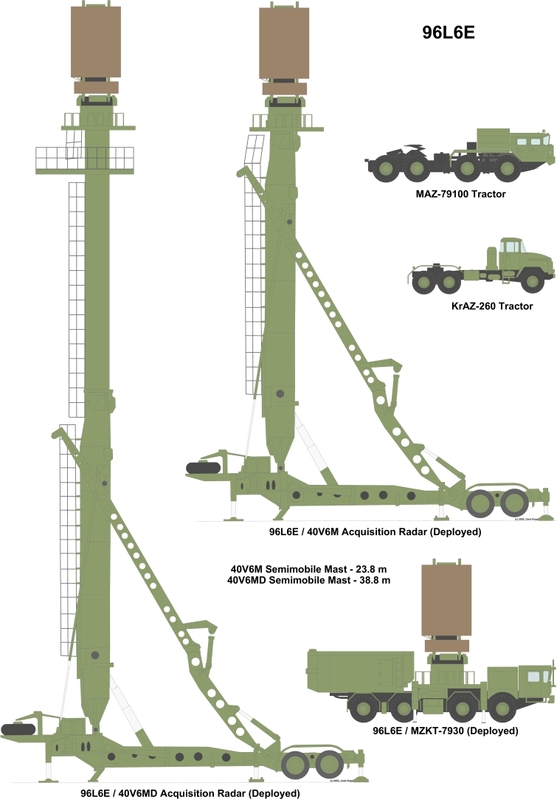 More recent (2007) VNIIRT data states 20 minutes to deploy the towed configuration, and 5 minutes to deploy a self-propelled configuration carried on a truck. This qualifies the towed Gamma DE as mobile, and the self-propelled configuration as "shoot and scoot". To date no details of the self propelled variant have been disclosed. Given the size and weight of the Gamma DE antenna system, the configuration is likely to be similar to that of the 91N6E Big Bird rather than 96L6 , most likely using the MZKT-7930 tow tractor, and a gas turbine generator equipped semi-trailer for the antenna head and equipment cabin. In the towed variant, radiofrequency datalinks permit the cabin to be located up to 1 km from the AESA, and additional datalinks permit up to 15 km separation between the cabin and an IADS command post. For semi-hardened revetted deployment optical fibre cables are available. 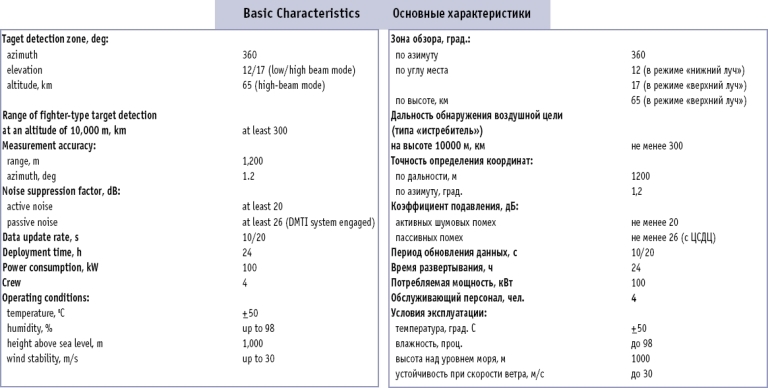 Almaz-Antey literature on the S-400 / SA-21 system states that compatible interfaces are available between the S-400 battery and the Gamma DE system. 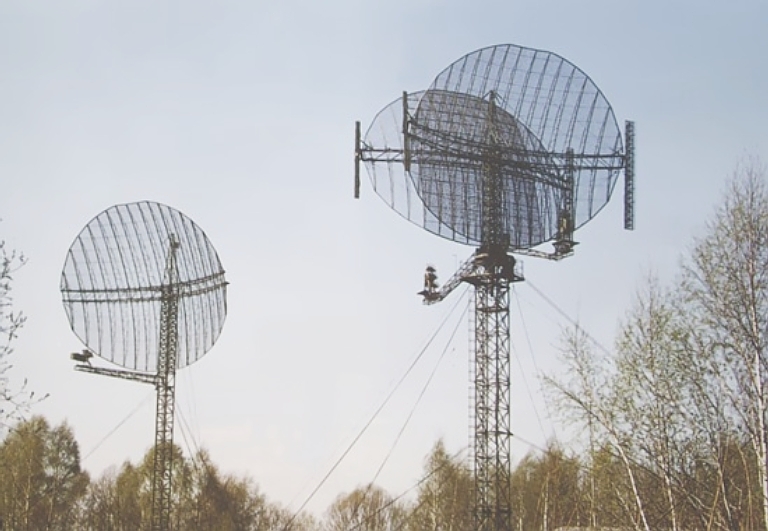 The azimuthal tracking accuracy of 0.17-0.2°, elevation accuracy of 0.2-0.3° and range accuracy of 60-100 metres make this radar eminently capable of providing midcourse guidance updates for a range of SAM systems. For comparison, the 64N6E Big Bird series used in the SA-20/21 has around twice the angular and range tracking error magnitude compared to the Gamma DE. VNIIRT Gamma DE AESA with radomes open for maintenance of the AESA . 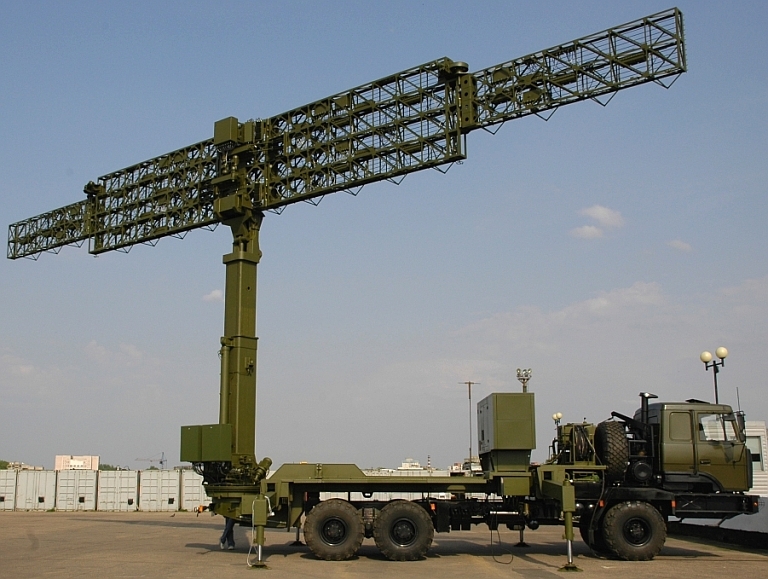 Notional configuration of a production 67N6E Gamma DE in mast mounted and self propelled variants. The exact configuration of either variant has yet to be disclosed (Author). 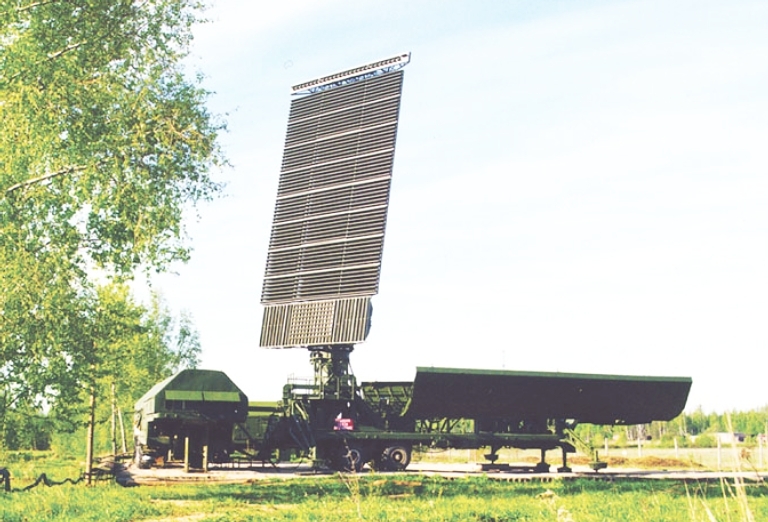 The NNIIRT Protivnik GE is a large mobile L-band 3D surveillance radar. 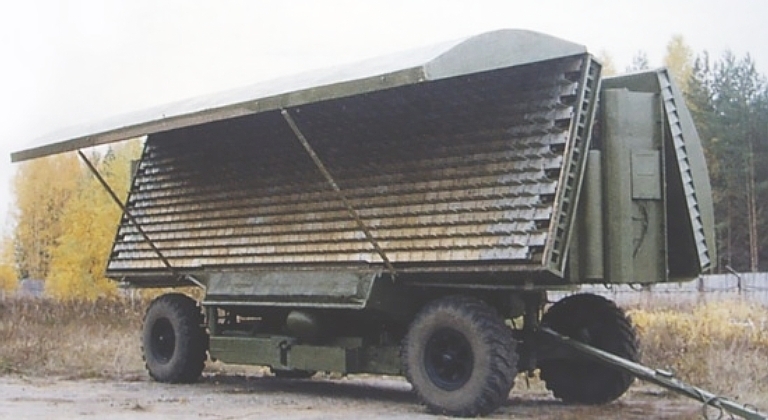 Carried on a pair of semitrailers, it can be deployed for operation in ~15 minutes. 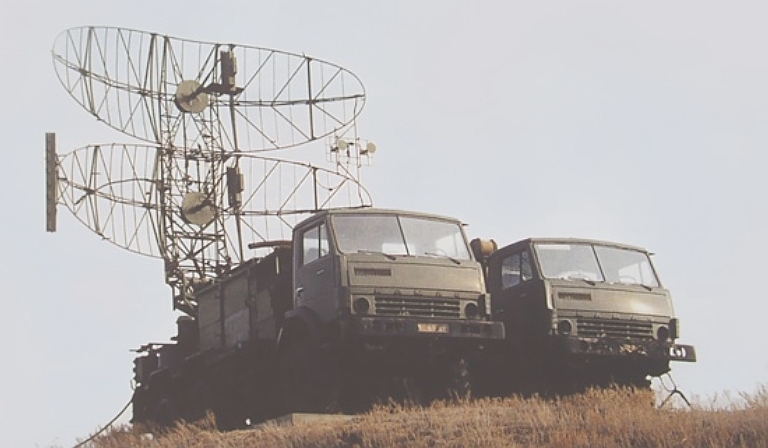 The NNIIRT Protivnik GE entered service in 1999 as a long range 1.3 GHz Band 3D search radar intended to support interceptors and Integrated Air Defence Systems. It is intended to detect and track aircraft and cruise missiles at all altitudes. The primary antenna planar array is designed for low sidelobes and backlobes - the inner sidelobes being cited at -40 dB and the average sidelobe level at -53 dB. The transmitter delivers a peak power rating of 500 kiloWatts, and a average power rating of 12 kiloWatts, with a 3 dB receiver noise figure. An IFF array is mounted beneath the primary aperture. 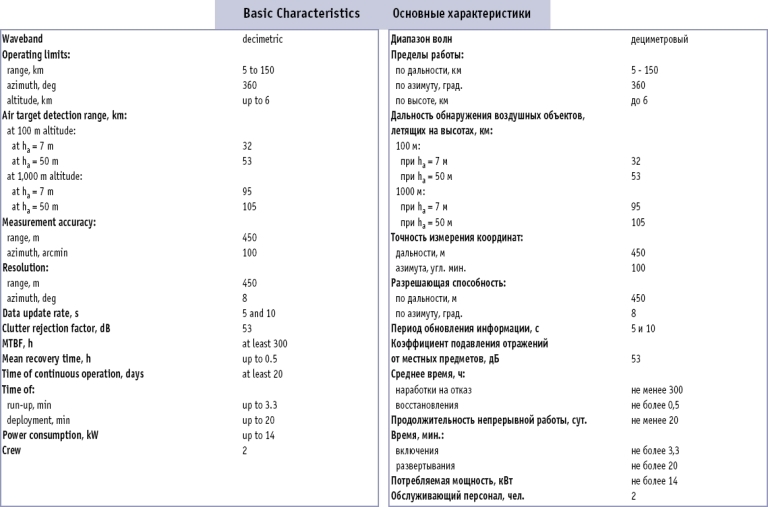 Russian sources claim the use of Space Time Adaptive Processing (STAP) techniques, as well as adaptive sidelobe nulling. All radar processing is digital. The 8.5 x 5.5 metre aperture planar array uses electronic beamsteering in elevation while azimuthal pointing is achieved by rotating the turntable. EU claim the ability to form up to twenty pencil beams to track precisely individual targets. 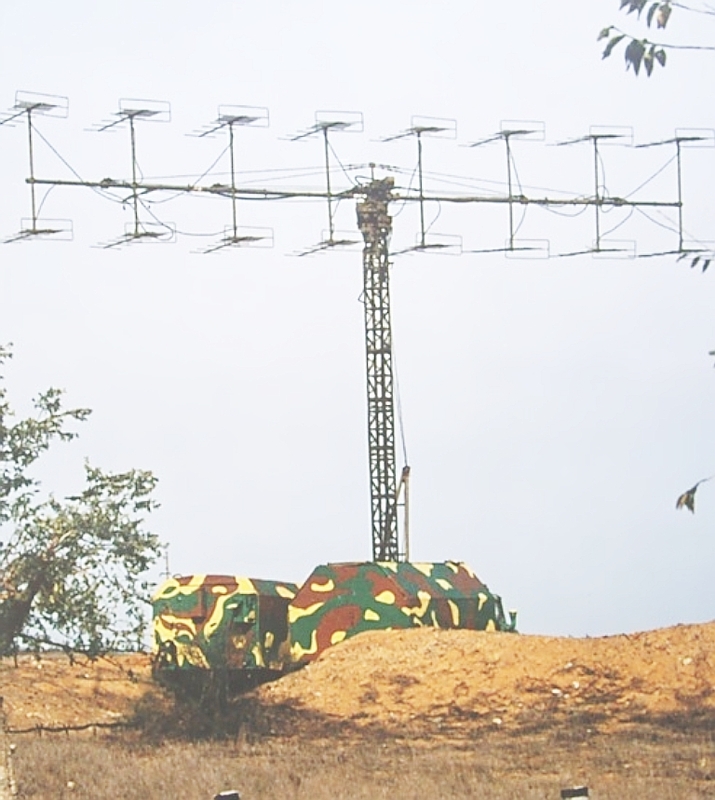 The azimuthal tracking accuracy of 0.2°, elevation accuracy of 0.17° and range accuracy of 50-100 metres make this radar capable of providing midcourse cueing for a range of SAM systems. 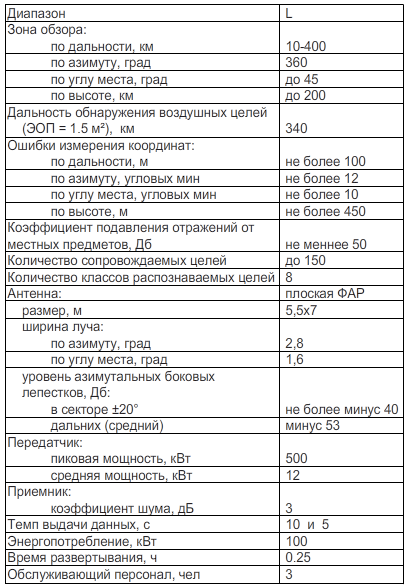 Almaz-Antey literature on the S-400 / SA-21 system states that compatible interfaces are available between the S-400 battery and the Protivnik GE. The radar is mobile, and with 15 minutes to deploy according to NNIIRT, it almost qualifies as "shoot and scoot". It is carried on a pair of semitrailers thus providing high road transit speed. 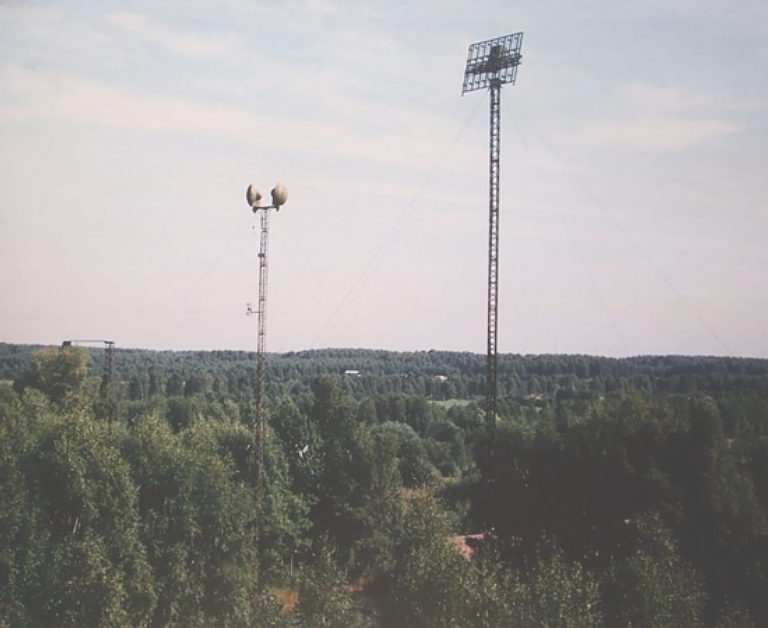 A 22 metre elevation mast system, probably the 40V6M, is claimed to be available, but imagery has yet to become available. A self propelled reduced aperture solid state AESA variant of the Protivnik GE has been developed as part of the new NNIIRT Nebo M Mobile Multiband Radar System, it is claimed to be equipped with a more advanced hydraulic stow/deploy mechanism intended to emulate the "shoot and scoot" capabilities of the 64N6E/91N6E series. Significantly, this new variant is an AESA design and will therefore provide agile beam steering and tracking capabilities absent in the original Protivnik GE, bringing it up to the technological standard and reliability of the competing VNIIRT Gamma DE series. Stowed electronics subsystem (Image © Miroslav Gyűrösi). 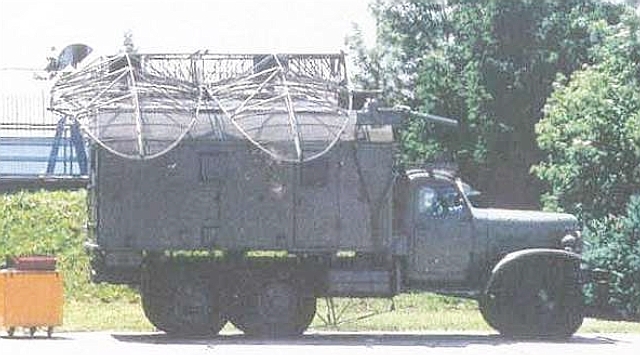 LEMZ 96L6E deployed configuration (above) and stowed configuration (below). 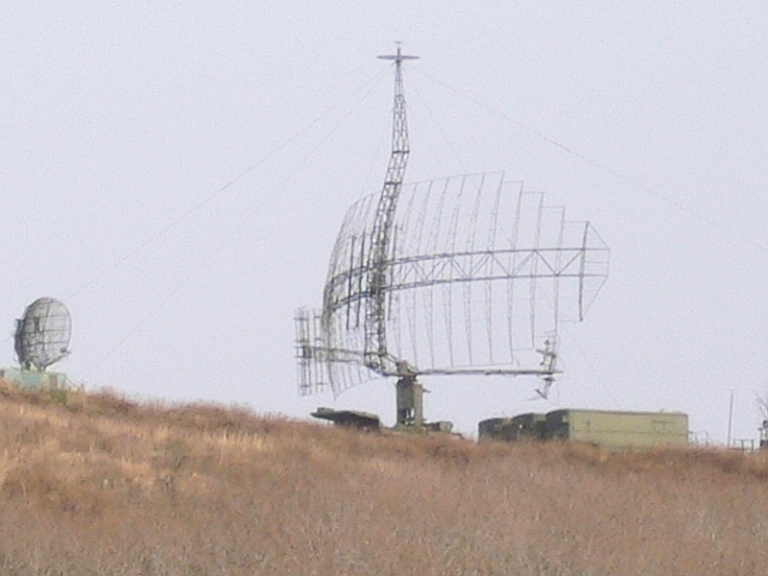 Russian sources consistently disagree on whether the radar operates in the S-band or L-band. It is carried by an MZKT-7930 vehicle. 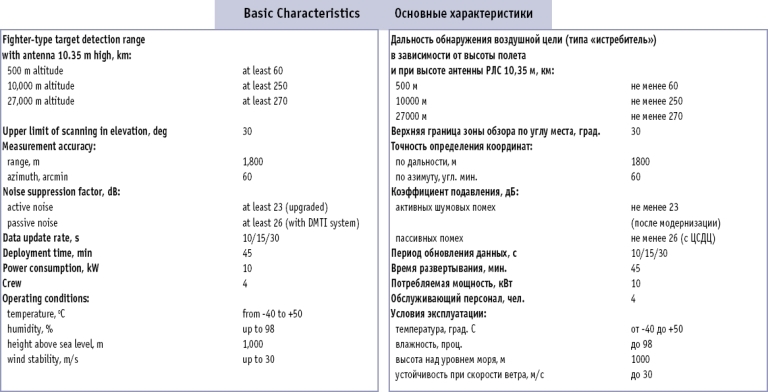 The 96L6E is standard with S-400 / SA-20 batteries and an option for older types such as the S-300PUM1/PMU2 / SA-20 (© 2010, Yevgeniy Yerokhin, Missiles.ru). 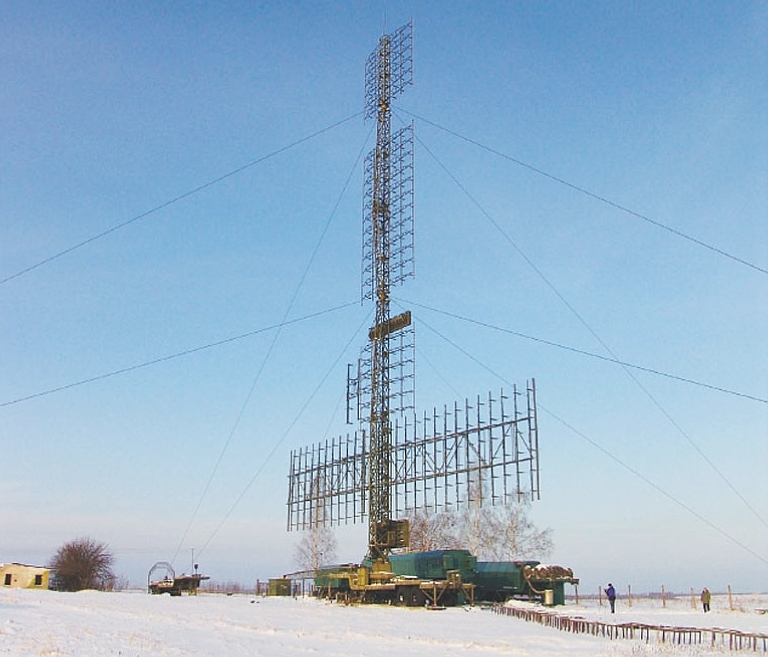 LEMZ 96L6E antenna deployed (© 2010, Yevgeniy Yerokhin, Missiles.ru). The 96L6 was developed by KB Lira and is built by LEMZ. 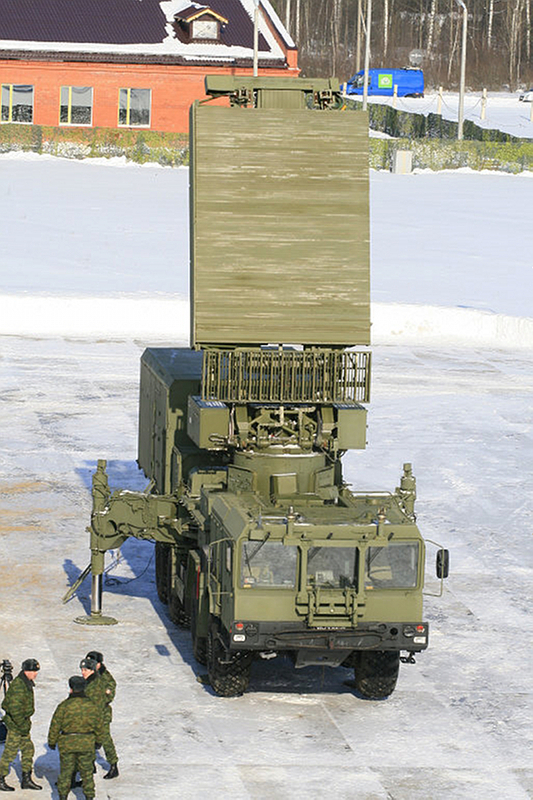 It was developed to replace the S-band 36D6 Tin Shield medium and high altitude acquisition radar, and the S-band 76N6 Clam Shell low altitude acquisition radar, with a design which is fully mobile and can redeploy as quickly as a 'shoot and scoot' missile battery. The 96L6 can be operating 5 minutes after coming to a stop. 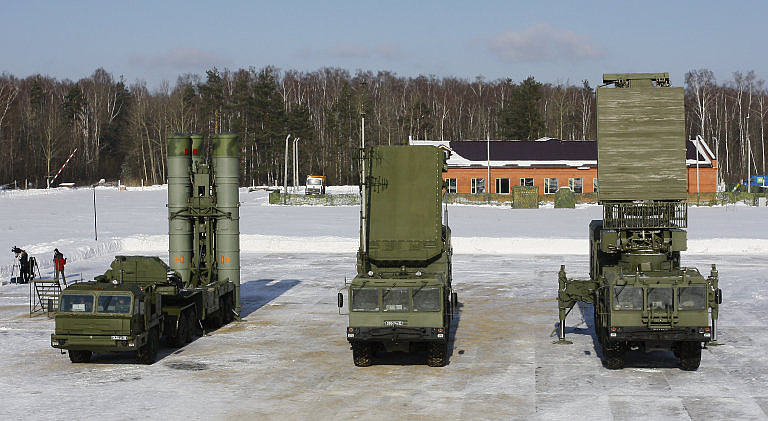 The 96L6 is the standard battery acquisition radar in the S-400 / SA-21 system, and is available as a retrofit for the S-300PM/PMU/PMU1 and S-300PMU2 Favorit / SA-20 Gargoyle as a substitute for the legacy acquisition radars. 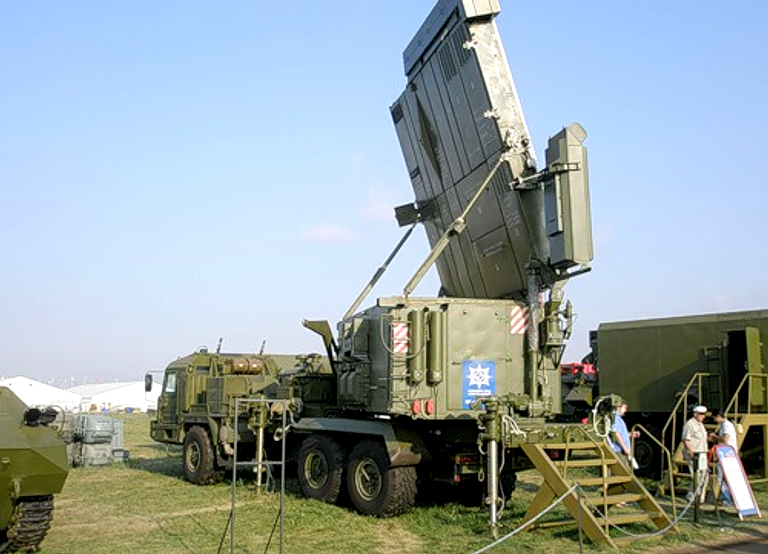 The radar interfaces to the S-300PMU2 via a radiofrequency datalink or optical fibre cable, and interfaces to older missile batteries via a conventional cable. 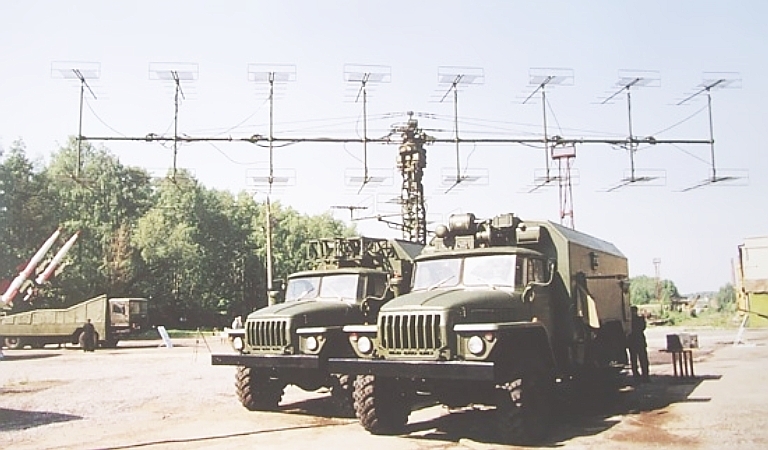 Interfaces are available for the 30N6E Tomb Stone, the 83M6 battery command post, and Integrated Air Defence System command posts including the Baikal-1E, Senezh-M1E, Osnova-1E and Pole-E. Links to the latter include radiofrequency datalinks or cables. Full azimuth search involves rotating the aperture through 360° and performing vertical sweeps electronically. Medium to low altitude targets can be acquired by constraining the mainlobe elevation angle between -3° and +1.5°, with a 12 second sweep period, or -1.5° and +20°, with a 6 second sweep period. Target velocity is limited to a range of 30 m/s to 1200 m/s. Sector search typically limits sweeps to a 120° sector, with a high sector search between 0° and 60° elevation requiring 8 seconds, or a low sector search between 3° and +1.5° requiring 5.5 seconds. 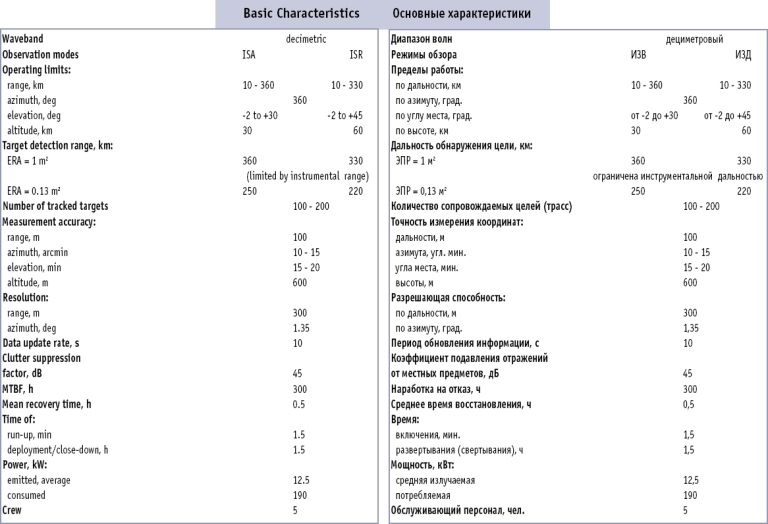 In these modes target velocities are limited to between 50 m/s and 2800 m/s. A dedicated low altitude search mode is also provided, with a 360 sweep performed in 6 seconds, for elevations between -3° and +1.5°. Two basic configurations of the design are available. 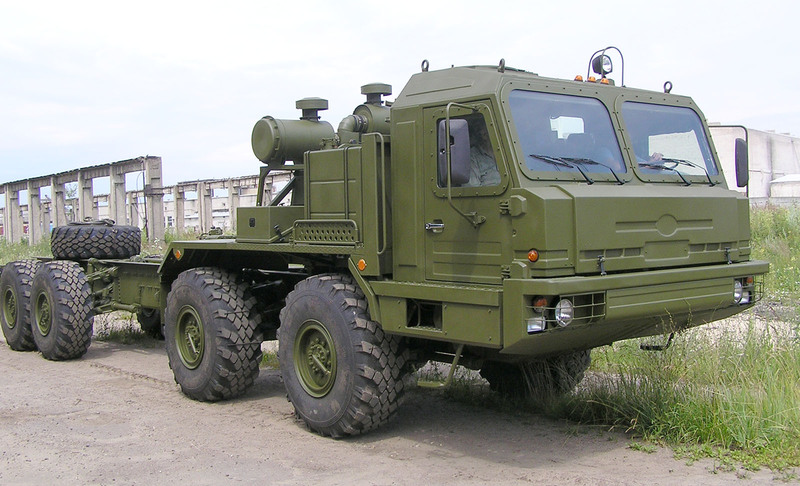 The first is the best known, the self propelled TM966E configuration, is carried on the MZKT-7930 chassis, itself derived from the MAZ-543 series first used with the S-300PS. This variant mounts the antenna head on a turntable and carries the equipment cabin, as well as an SEP-2L power generator. 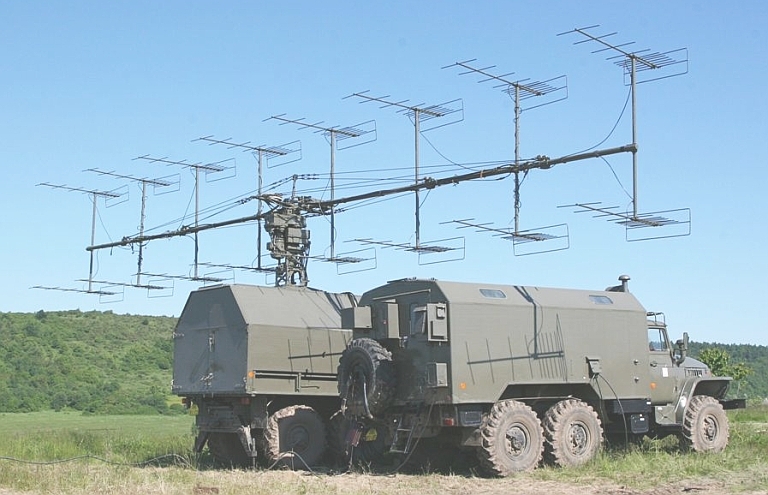 The second configuration is semimobile, and uses a pair of trailers, one mounting the antenna head and the SES-75M power supply, the other the equipment cabin, these being connected by up to 100 metres of cable. Accessory options include the 98E6U generator, tow tractors, and either the 24 metre 40V6M or 40 metre 40V6MD semi-mobile mast systems. The latter are carried by semi-trailer and typically towed by a MAZ-537 or other tractor. 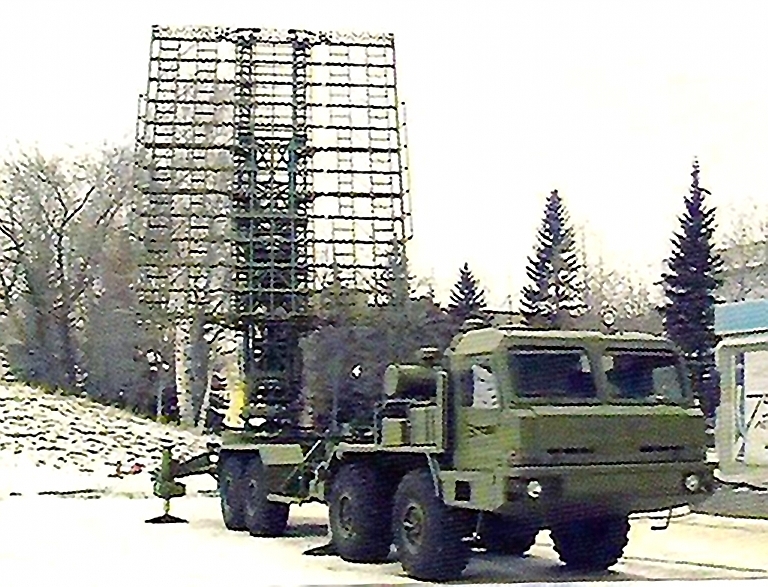 Both the manufacturer LEMZ and Almaz-Antey are offering the 96L6 with the 40V6M series masts widely used with the 76N6 Clam Shell and 36D6 Tin Shield S-band radars. To date no photographs of this configuration have emerged. A towed variant also exists (Author). S-400 battery with 96L6 deployed (© 2010, Yevgeniy Yerokhin, Missiles.ru). The YLC-4 is large long range VHF/UHF band solid state redundant 2D search radar, intended for military and civil ATC and early warning. 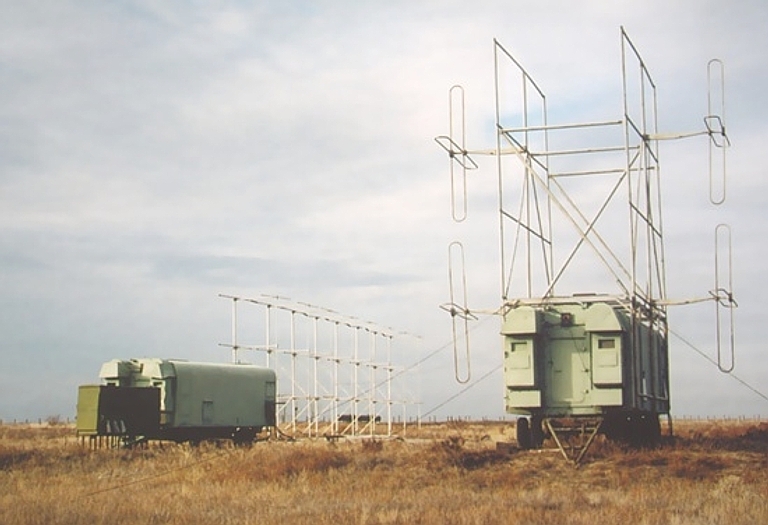 The system comprises the antenna and three additional trailers, at best the system is semi-mobile. The design uses digital AMTI processing, and is a burst-to-burst, pulse-to-pulse automatic pseudorandom adaptive frequency hopper. The transmitter employs 21 air cooled solid state amplifiers. NNIIRT's Barrier E is a low power bistatic radar system intended to provide tripwire early warning against low signature targets at low to medium altitudes. It is analogous in some respects to the US Silent Sentry, but quite unique in implementation. 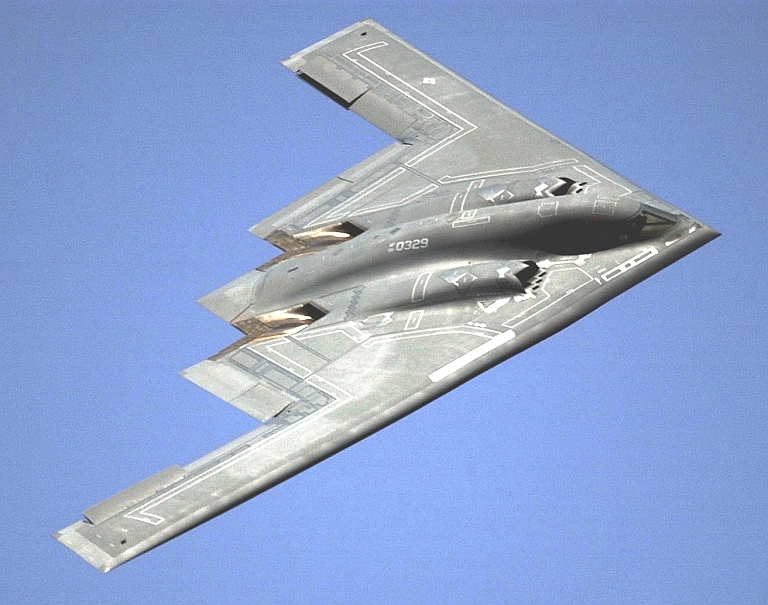 The stated purpose of the design is to detect stealth aircraft, cruise missiles, conventional combat aircraft, lighter-than-air vehicles and ultralights. Geographical emplacement is intended to exploit terrain, blocking mountain passes, harbour entrances, or narrow maritime straits. 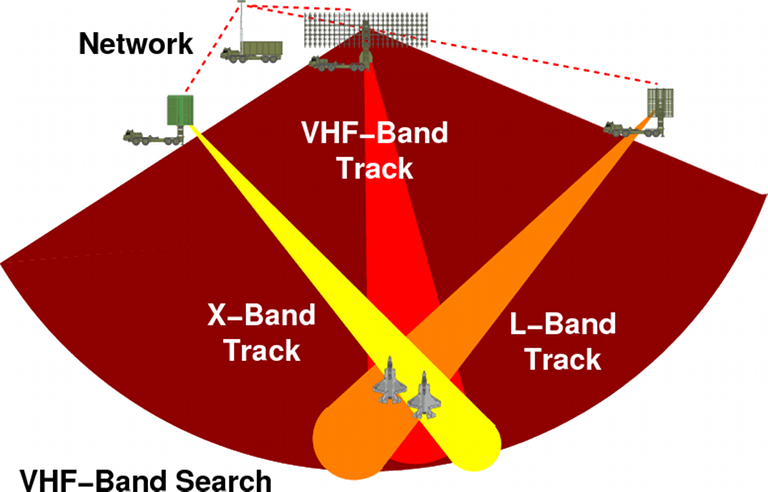 The system is typically deployed to form a radar fence in which a chain of stations produces individual coverage zones between pairs of stations. The transmitters operate at very low power levels, cited at 1-3 Watts, and the transmit signal is modulated with datalink or other communications traffic. Antennas are mounted on tethered masts to provide best possible station spacing. Up to ten stations may be chained together, ~30 NMI apart, to form a 300 NMI tripwire fence. Each segment in the chain provides altitude coverage up to ~23 kft, with a maximum mainlobe width of 6.5 NMI. The Barrier E is designed for unattended operation, with remote stations comprising antenna/mast assemblies for transmit/receive functions, a containerised signal and data processing module, a remote built in test facility, with the transmitters employed to provide datalinking to the central master station. The latter provides operator consoles and an automated data processing facility. "The Podsolnukh E HFSWR is intended for use in coastal defence systems to surveil surface and air targets in the 200-mile economic zones of littoral nations. 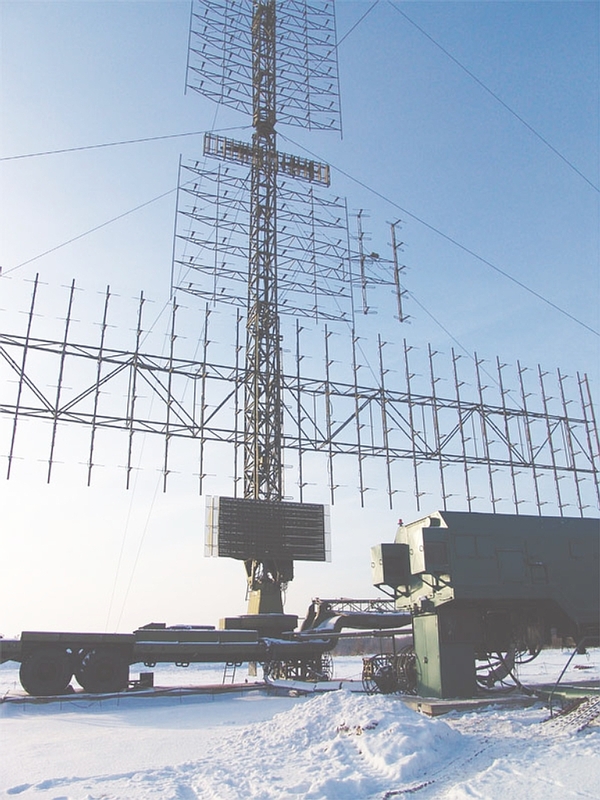 The Podsolnukh E HFSWR is an automated means to surveil the all-weather surface and air environment by creating a shortwave band surface wave extending to high altitudes and beyond the radar horizon. The processing and display of information on air and sea targets is performed by a specialized multiprocessor computing system. Digital interfaces provide the Podsolnukh E HFSWR with the ability to interface with a variety of other systems, according to the agreed customer requirements, and formats coordinate and tracking information to match the system and command centers in digital form. OAO NPK NIIDAR performs development work on the adaptation of the Podsolnukh E HFSWR to accommodate local conditions in accordance with the requirements of the customer. 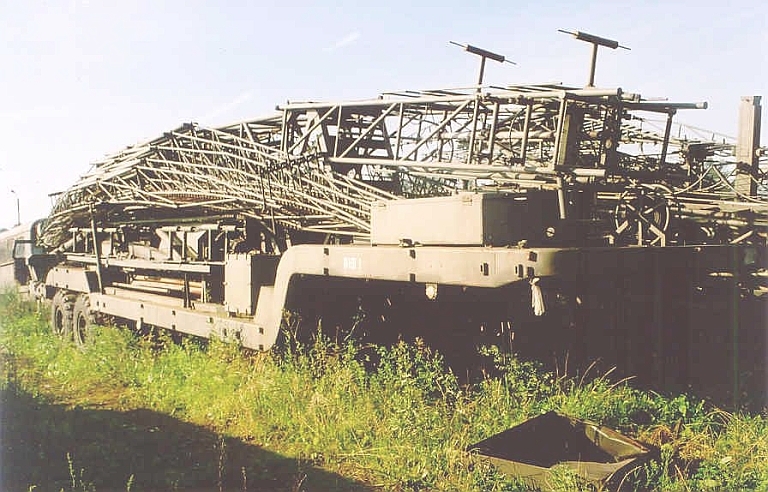 Radar equipment and components of the antennas are transported by road, rail and sea transport. Assembly, installation and deployment of the equipment is provided to pre-arranged sites." 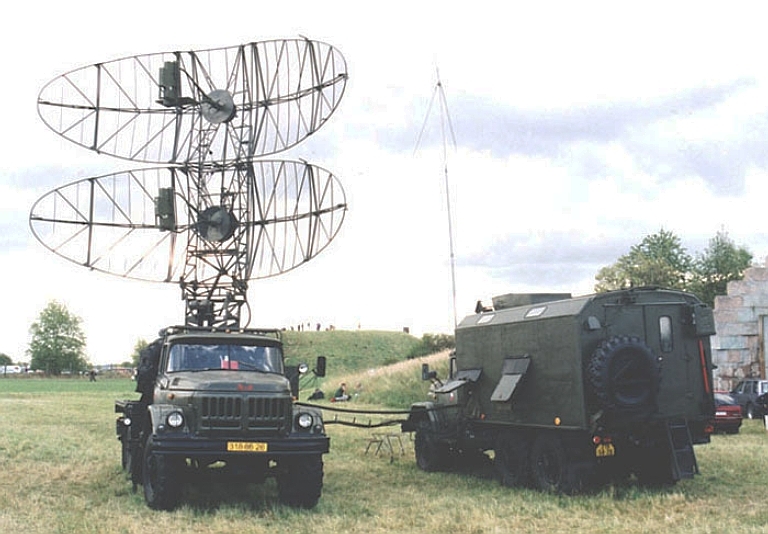 Nebo-M RLM-D L-band radar on BAZ-6909 vehicle, stowed. 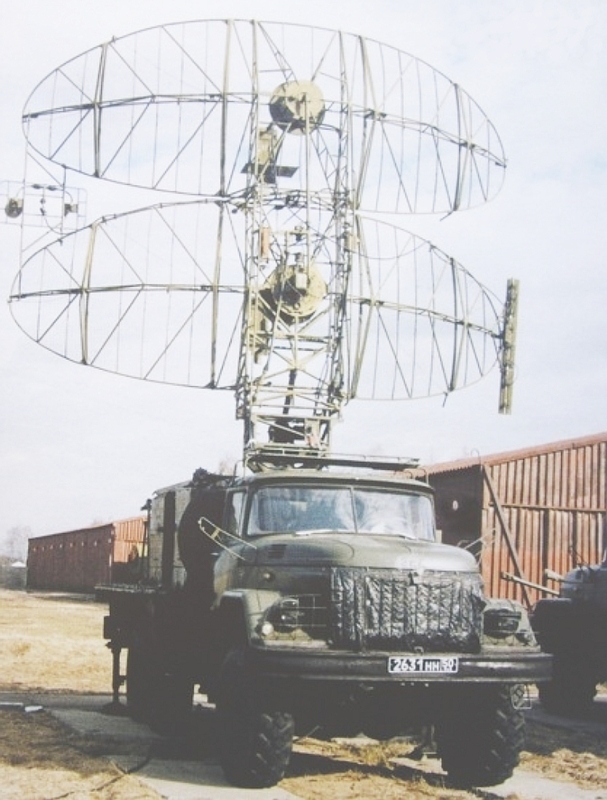 In late 2008, details emerged of a new multiband 3D radar system in development by NNIIRT, designated the Nebo M. The Nebo M is a radical departure from previous Russian designs. The self-propelled Nebo M is a package of three discrete radars and a single processing and command van, all hosted on BZKT BAZ-6909-015 8 x 8 all terrain 24 tonne chassis, based on the same vehicle as the S-400 / SA-21 5P85TE2 TEL and the proposed wheeled SA-23 variant. The Nebo M combines derivatives of three existing NNIIRT 3D radars, the VHF band Nebo SVU, the L-band Protivnik G and the S/X-band Gamma S1. 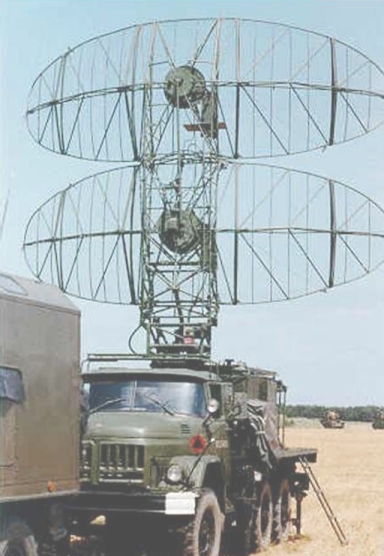 While the NNIIRT slide (below) attributes the VHF component to the 55Zh6 Tall Rack, the actual antenna design is clearly based on the solid state Nebo SVU AESA design. The L-band component antenna has a reduced aperture size compared to the semi-trailer hosted 59N6E radar. 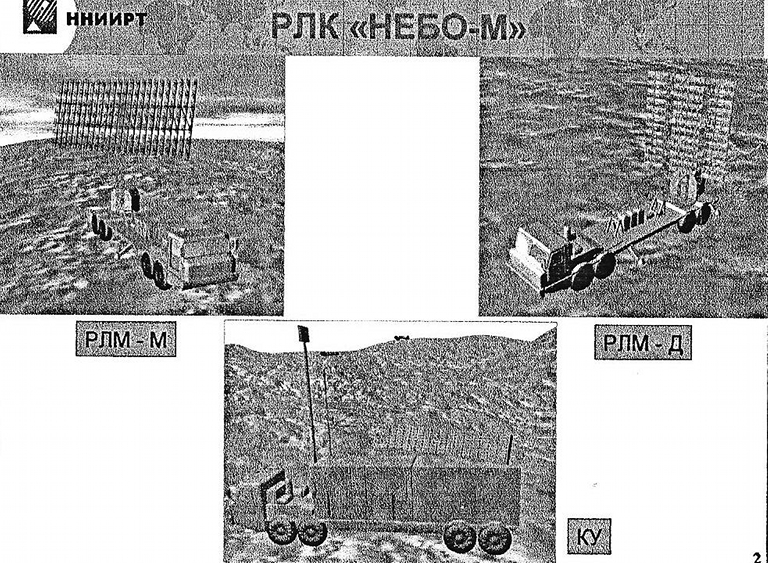 Available imagery of prototype hardware shows the VHF-band and L-band components, both of which were not previously available in self-propelled all terrain configurations, unlike the Gamma S1/S1E. The KU vehicle in the suite is the operator van. Each vehicle has an independent generator rated at 100 kiloWatts. 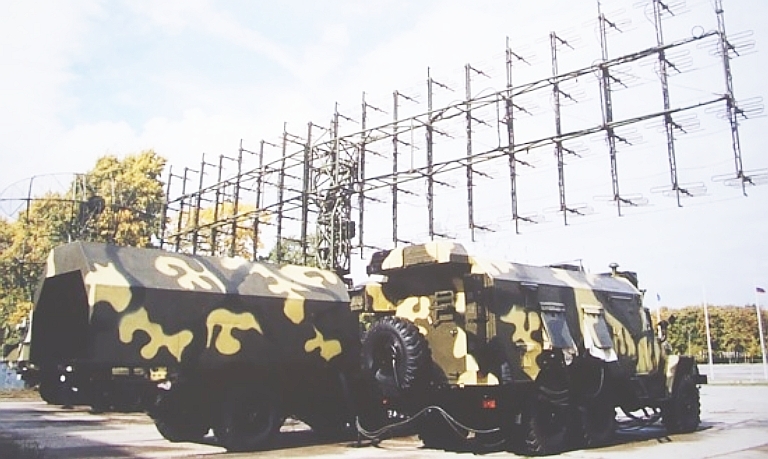 All radar vehicles have an integrated hydraulic stow and deploy system for folding and unfolding the antenna, to support shoot-and-scoot operation, and all are equipped with dual mode GPS/Glonass navigation systems for this purpose. 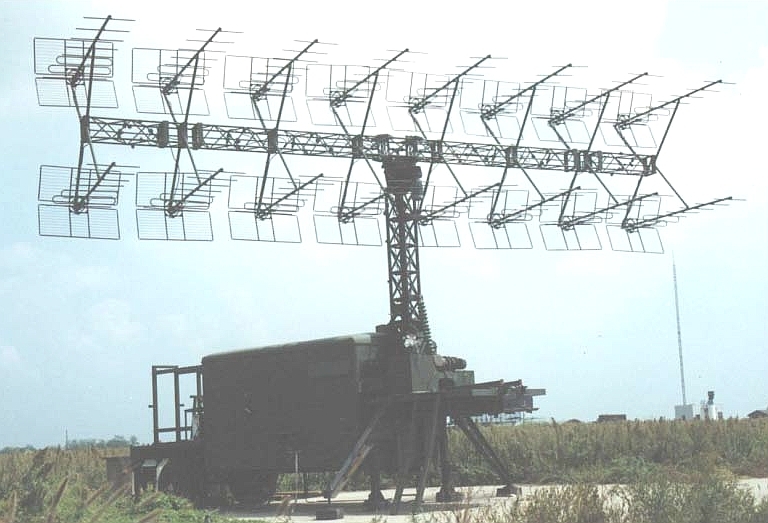 All radars are cited as solid state AESAs, with the capability to operate in an agile beam sector search/track regime, or in a conventional circular scan regime, with the antennas mechanically rotated. The idea of integrating three radars, each operating in a discrete band, is novel and clearly intended to provide a counter-VLO capability. A track fusion system in the KU vehicle will be required, providing a capability analogous to the US Navy CEC (Cooperative Engagement Capability)system. This technology was previously developed for the Salyut Poima E track fusion system and is now becoming mature. Available imagery of prototype Nebo M hardware shows the VHF band RLM-M system and L-band RLM-D system. Technical details and marketing materials for the Nebo M have yet to be released, and what is available appears to be a controlled leak by the design office, which excludes details such as power ratings and component detection/track range and angle performance. 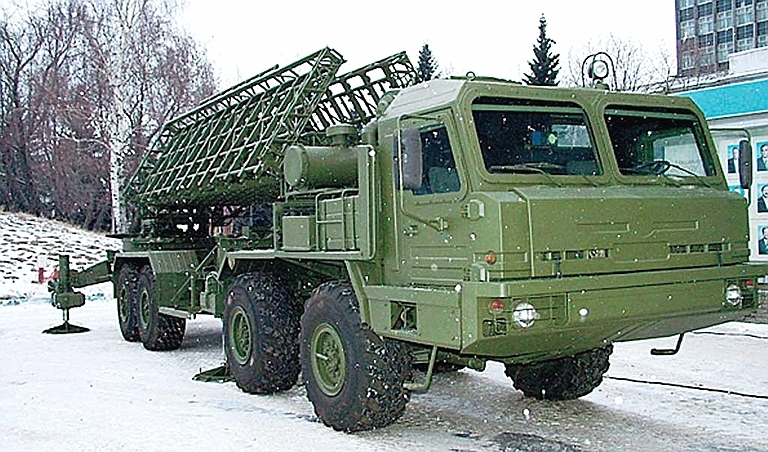 Even if the Nebo M does not achieve production status in its intended configuration, the development of self propelled variants of the Nebo SVU and Protivnik G/GE low band radars is in itself a significant advancement, as both present as effective battery acquisition radars for the S-300PMU1/2, S-400 and a range of legacy SAM systems, hosted on the BAZ-6909 both radars acquire mobility to match other components of an S-300P/S-400 missile battery. Central track processing and fusion system with multiple operator consoles. The Nebo-M system is clearly designed to hunt the F-35 Joint Strike Fighter. 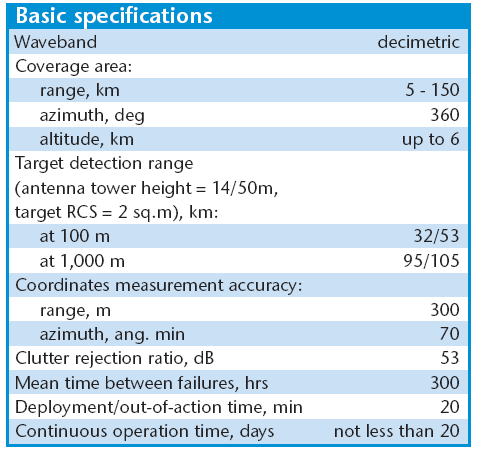 The VHF-Band component of the system provides sector search and track functions, with the X-Band and L-Band components providing a fine track capability. 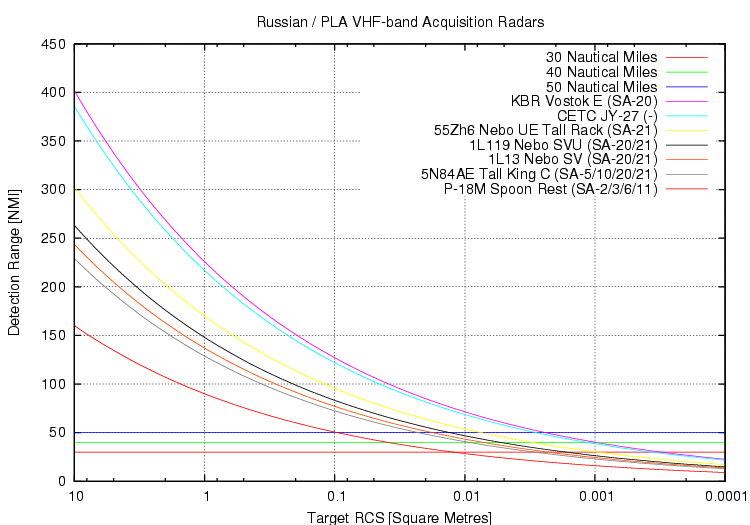 By good placement of the radars relative to the threat axis, the L-Band and X-Band components illuminate the incoming target from angles where the target RCS is suboptimal. 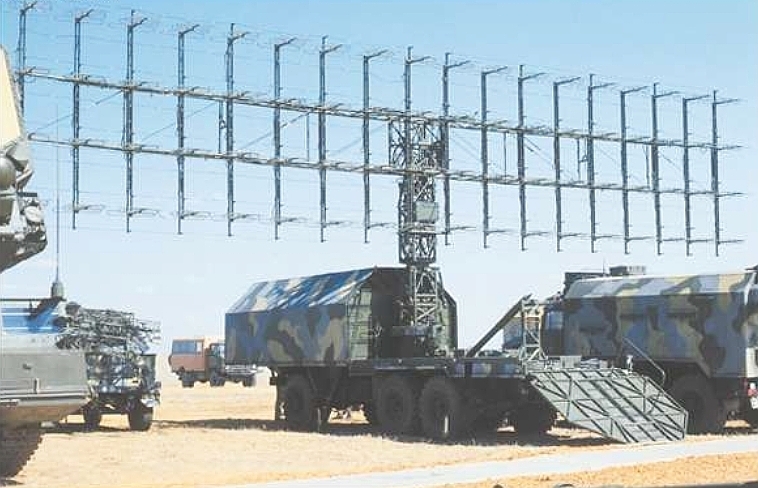 Attempts to jam the Nebo-M will be problematic, since all of these radars have a passive angle track capability against jammers, as a result of which usage of a jammer permits passive triangulation of the target using three angle track outputs. 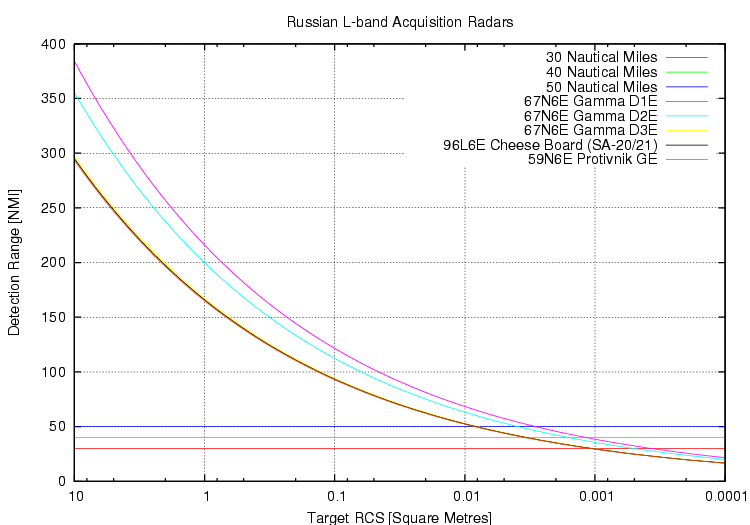 The RLM-S and RLM-D have better elevation tracking accuracy than the RLM-M, and therefore the Nebo M should be capable of producing high quality tracks suitable for midcourse guidance of modern SAMs and full trajectory guidance of legacy SAMs. 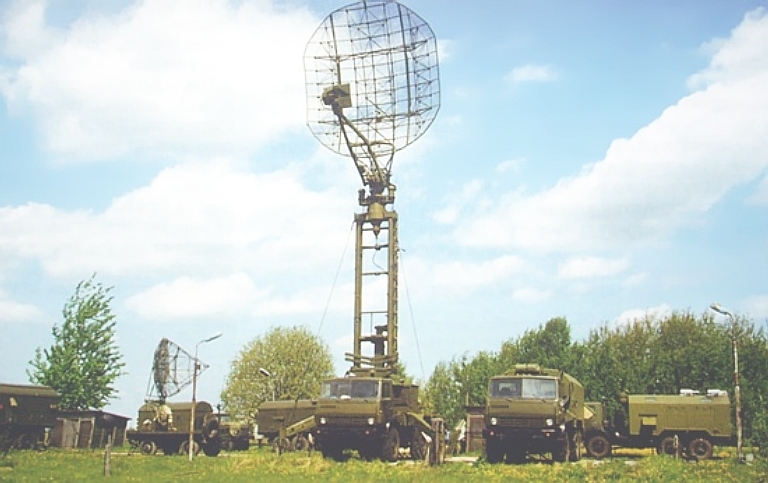 RLM-M component of the Nebo M, based on the VHF band Nebo SVU. This is effectively a self-propelled derivative of the Nebo SVU demonstrator design. 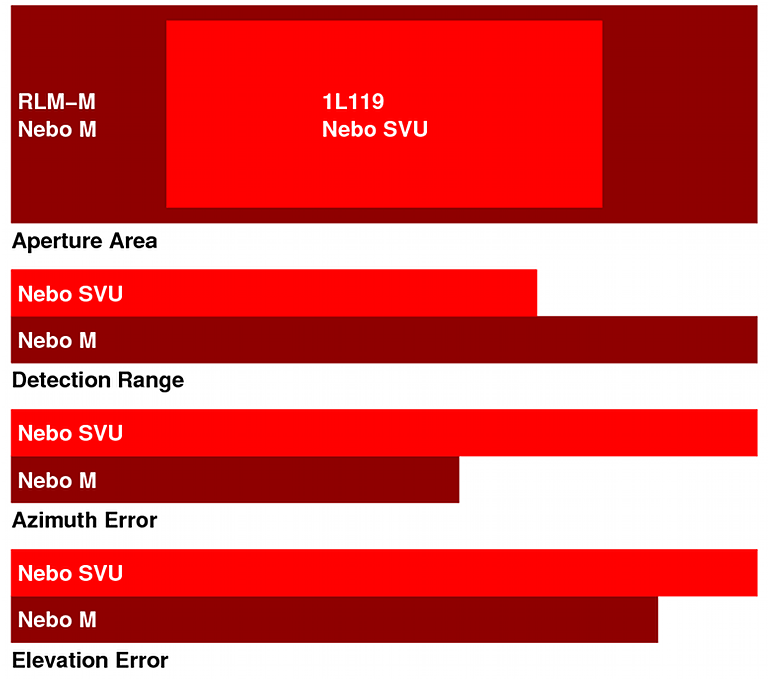 Below, performance comparison between Nebo SVU and Nebo M.
RLM-D component of the Nebo M based on the L band Protivnik G/GE series. This is effectively a self-propelled derivative of the towed 59N6E series, but using AESA technology and a smaller aperture area. Baseline Gamma S1/S1E on the BAZ-64022 chassis, the RLM-S will be a similar configuration (Said Aminov Vestnik-PVO). BAZ-6909-015 8 x 8 all terrain vehicle. 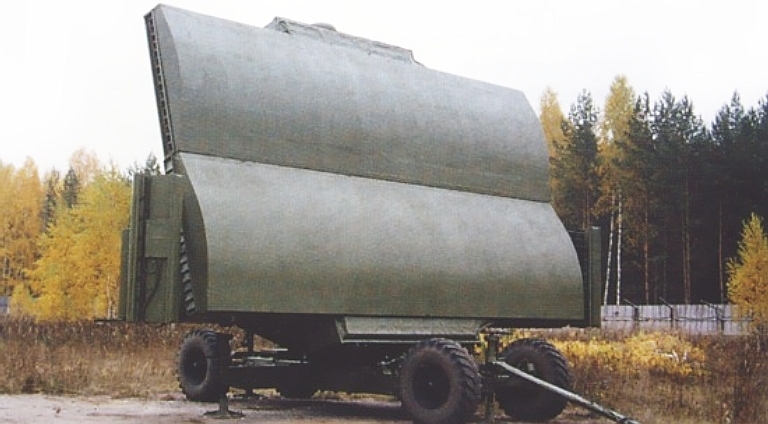 This design is also the basis of the tow tractor used for the new 5P85TE2 TEL for the S-400 / SA-21 SAM system.